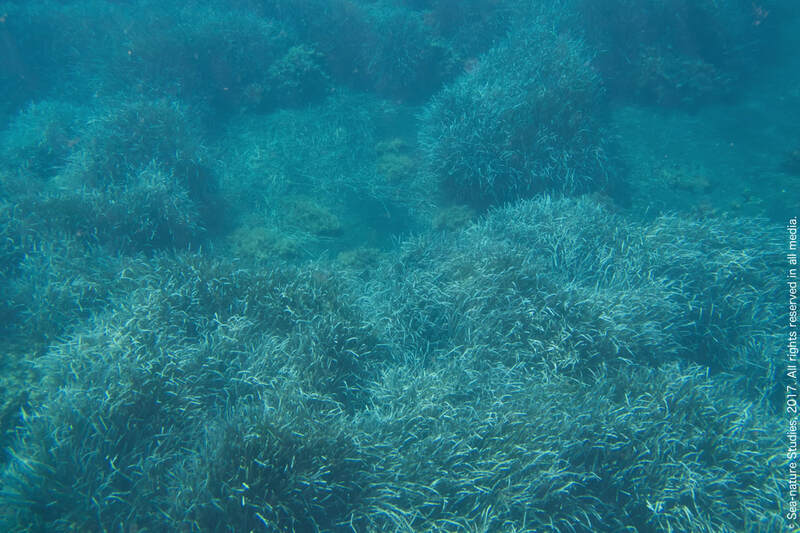 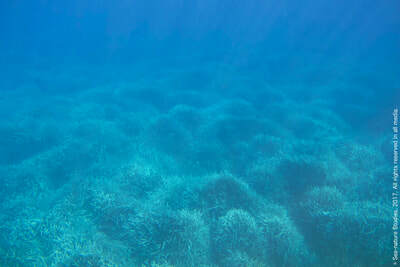 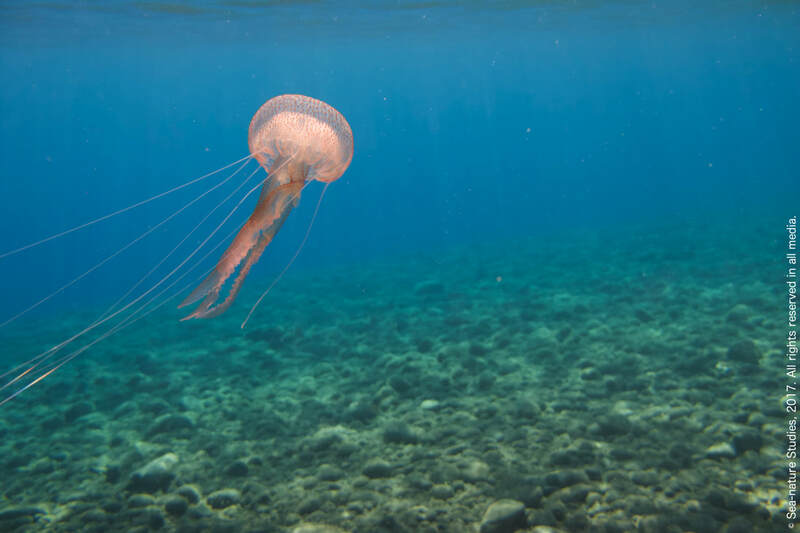 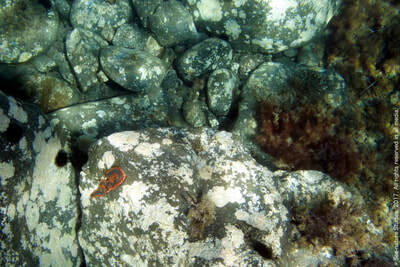 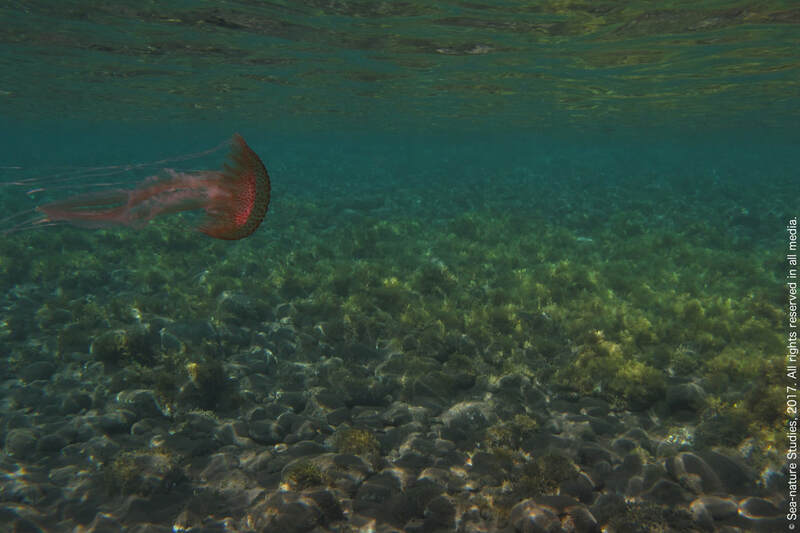 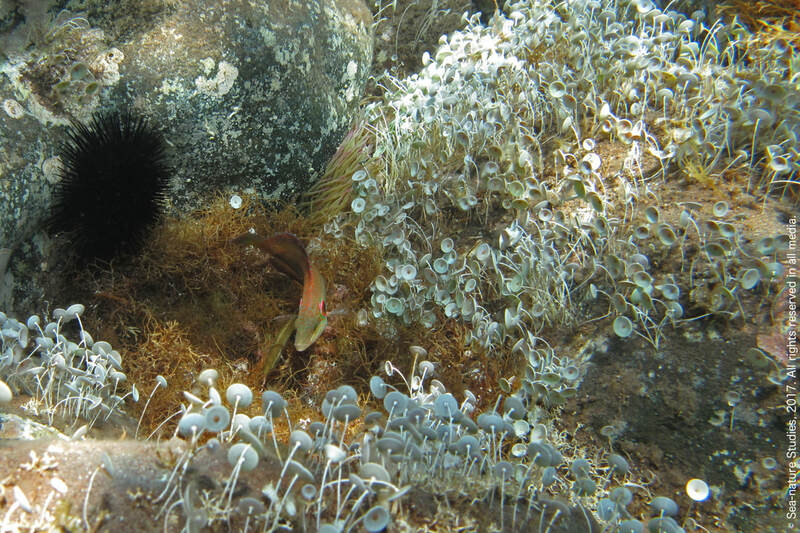 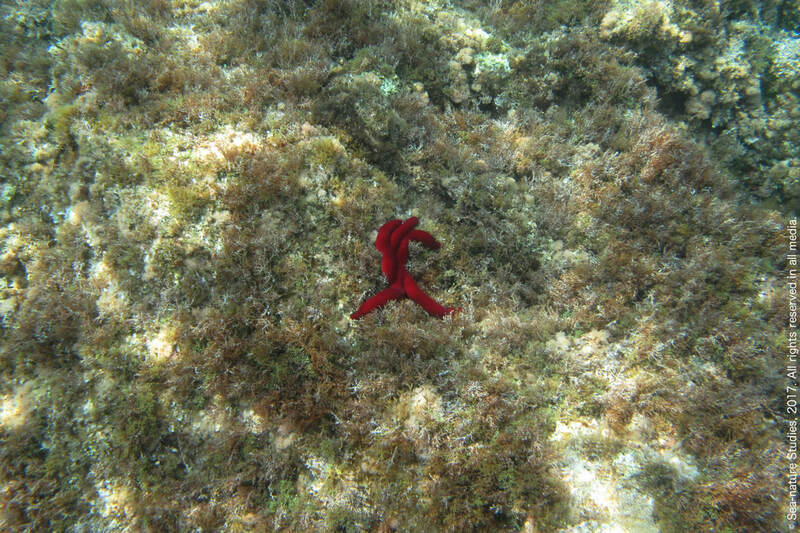 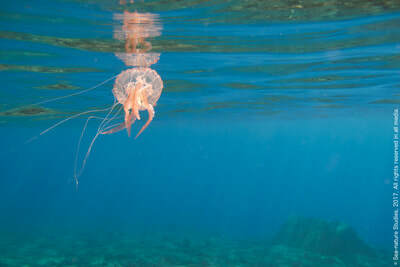 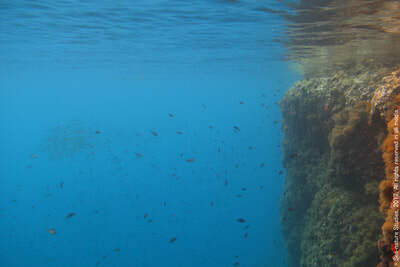 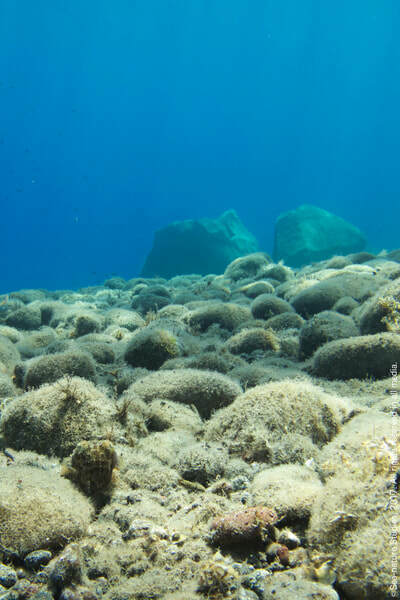 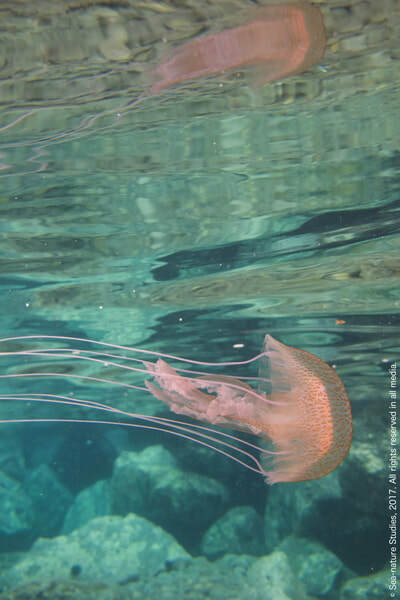 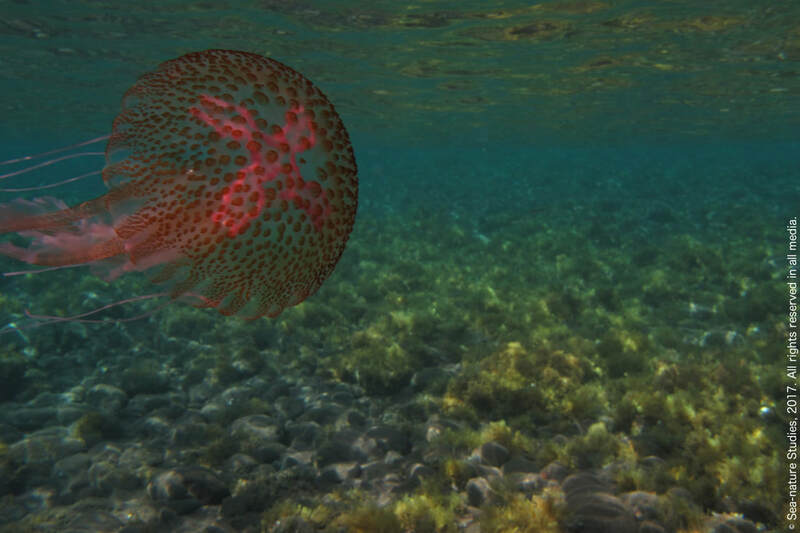 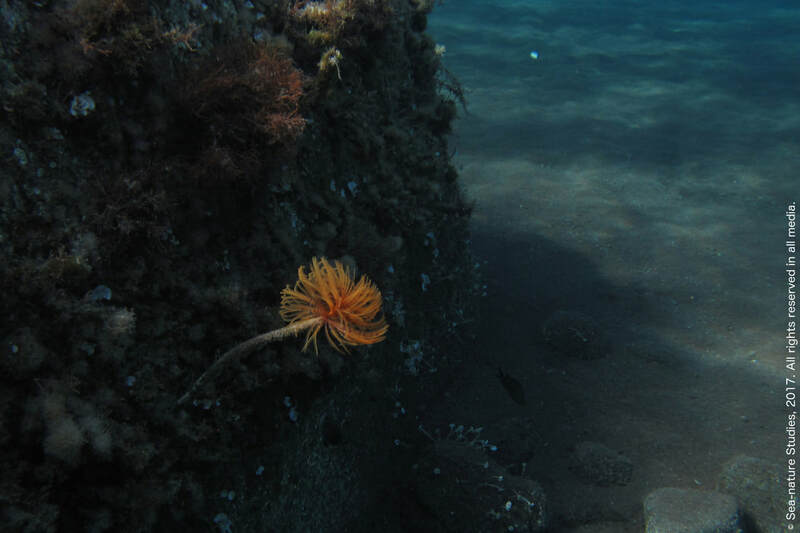 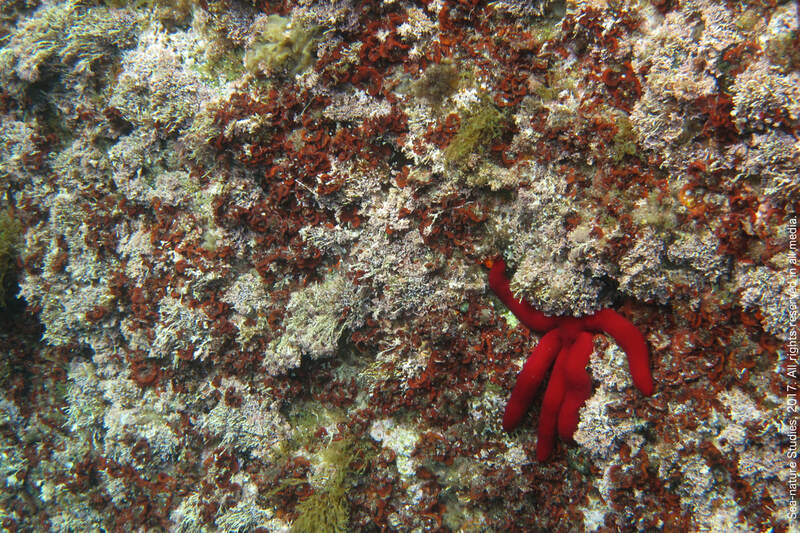 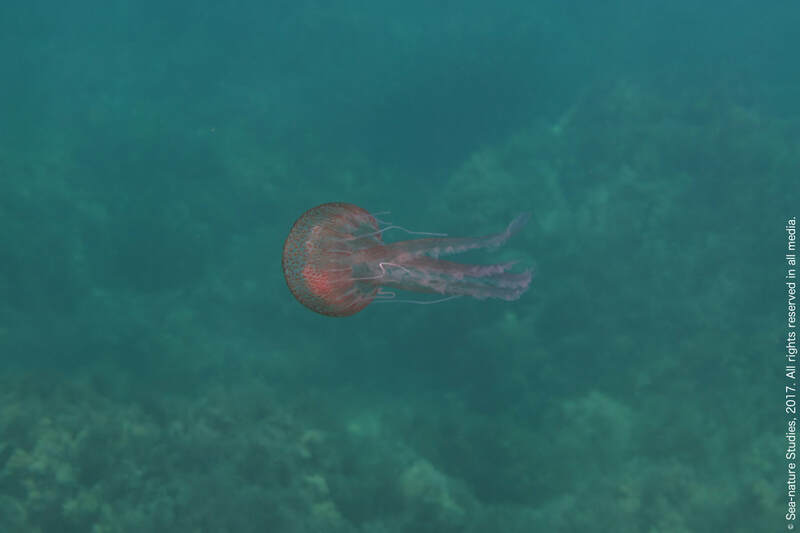 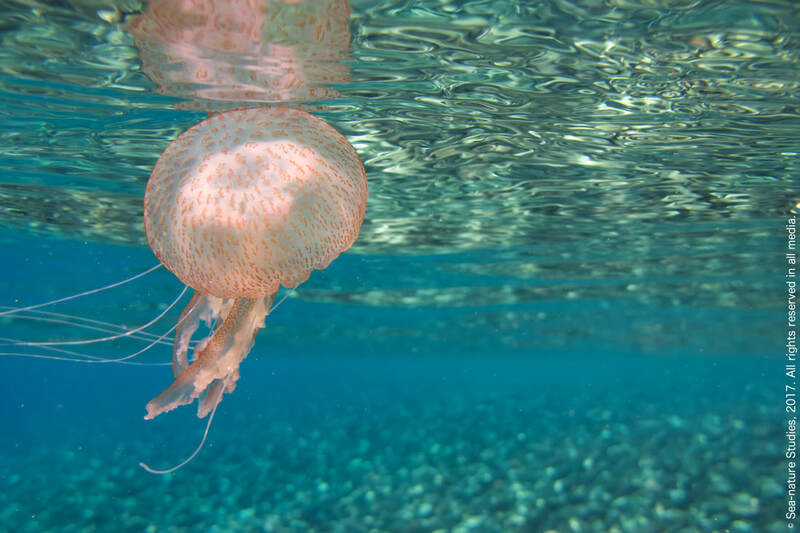 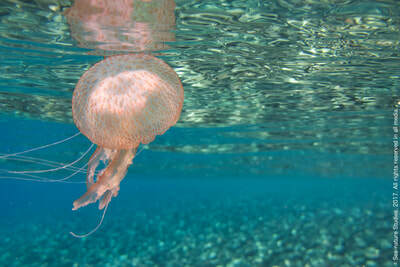 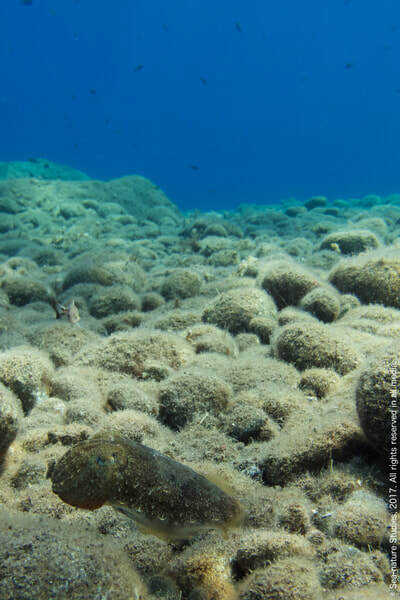 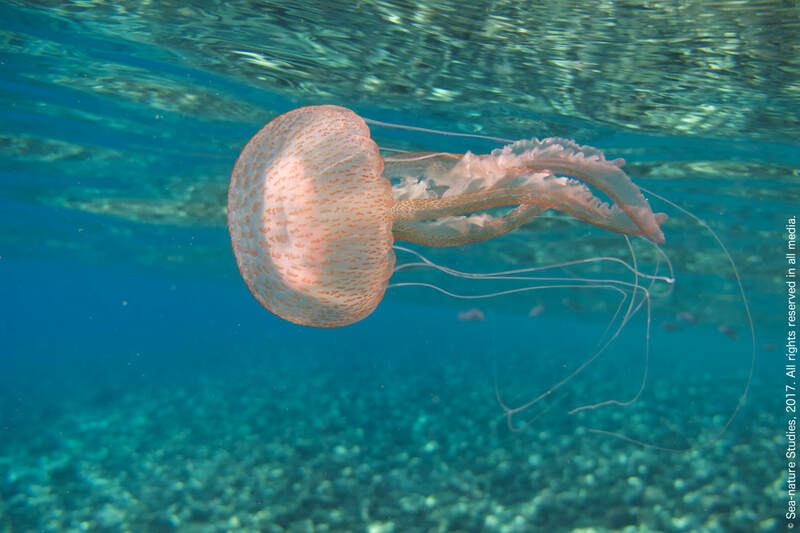 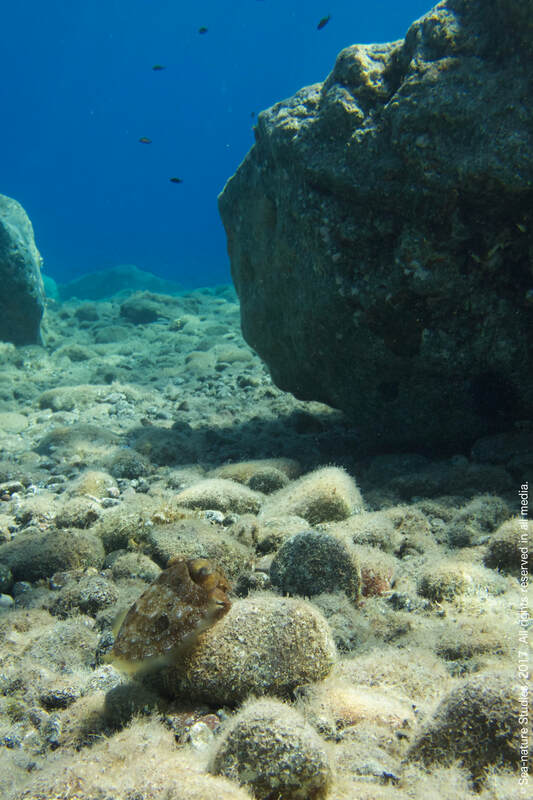 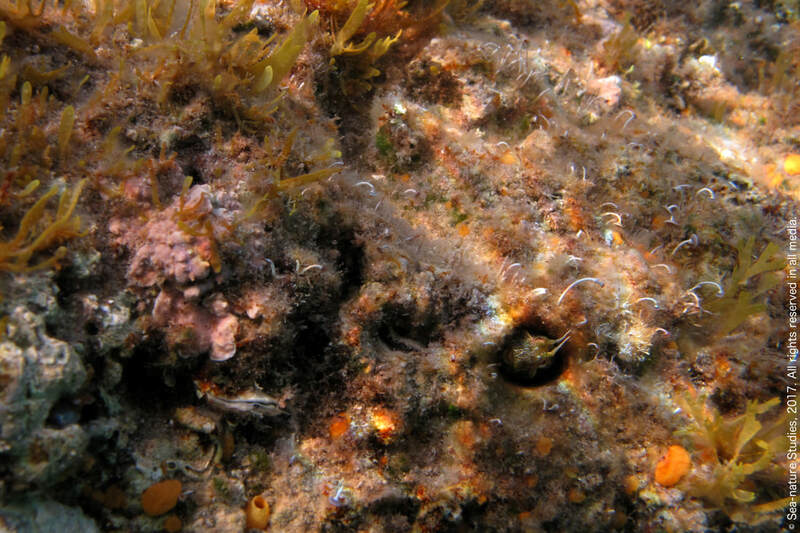 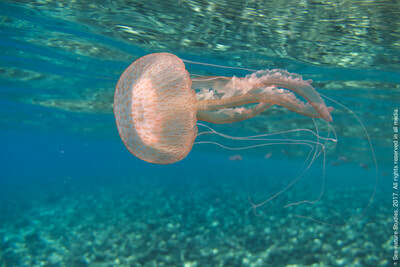 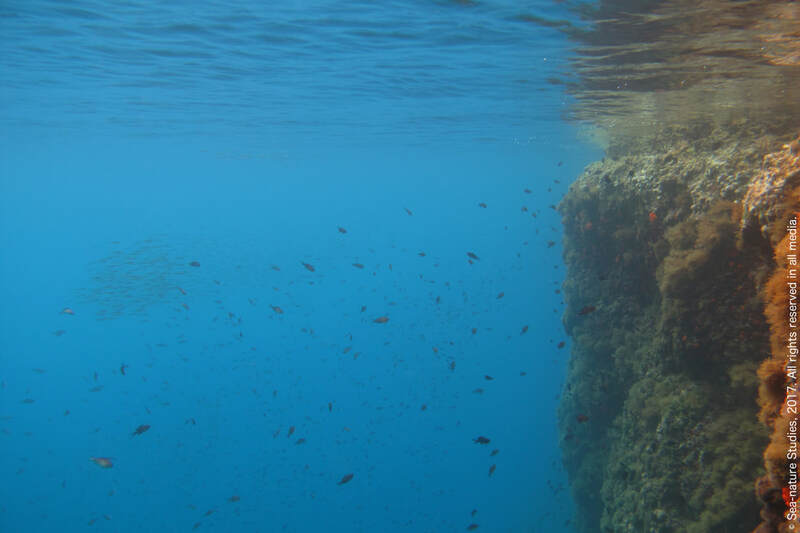 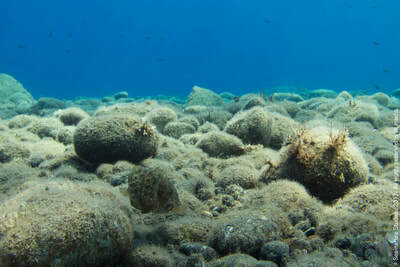 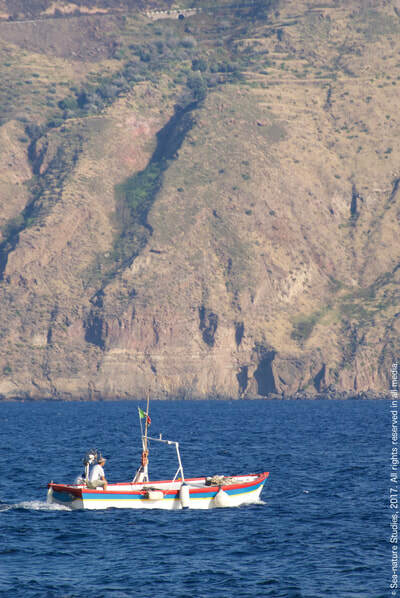 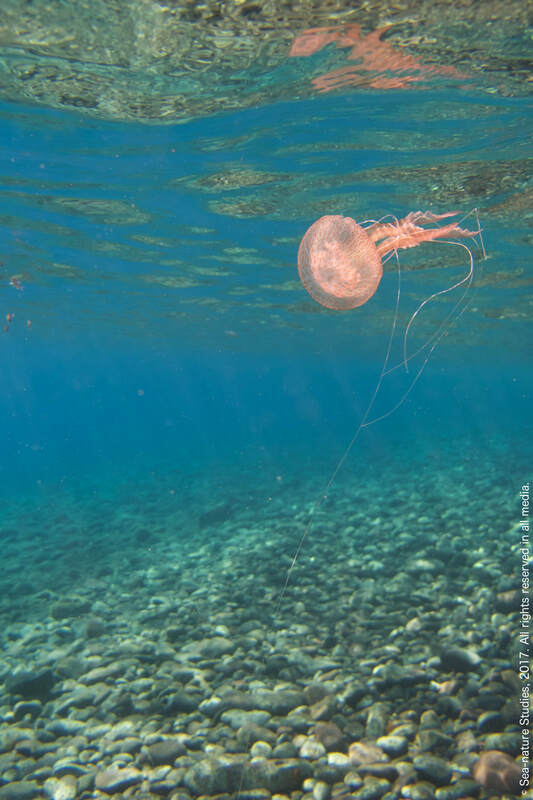 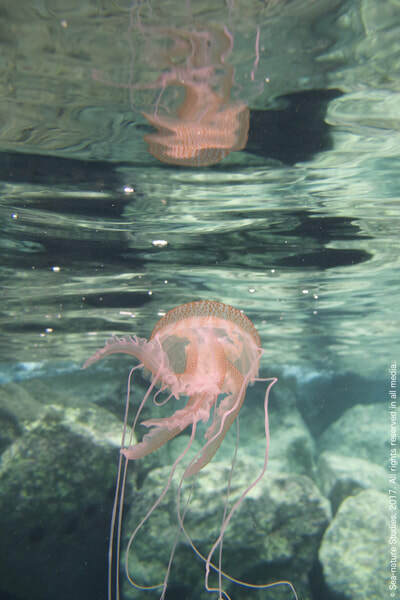 Snorkel scenes - some of the fauna and flora of the Aeolian Islands (le Isole Eolie) and north-east Sicily. 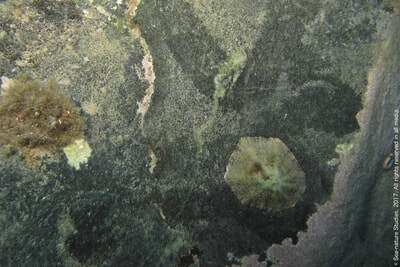 Acetabularia acetabulum (Linnaeus) P.C.Silva, 1952. Latin, 'acetabulum', a 'cup-shaped vessel'. 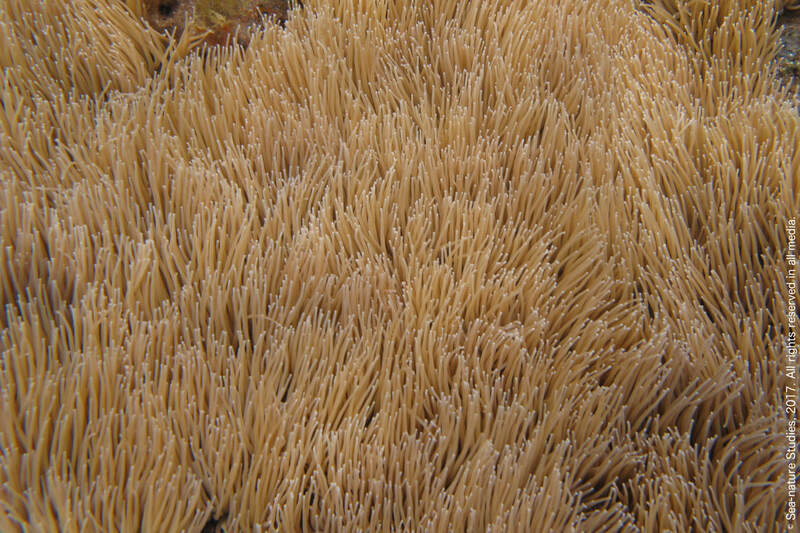 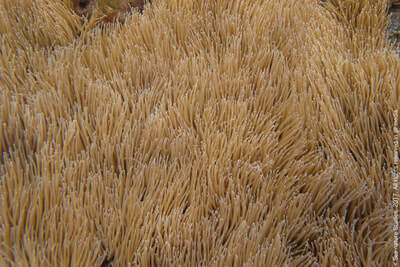 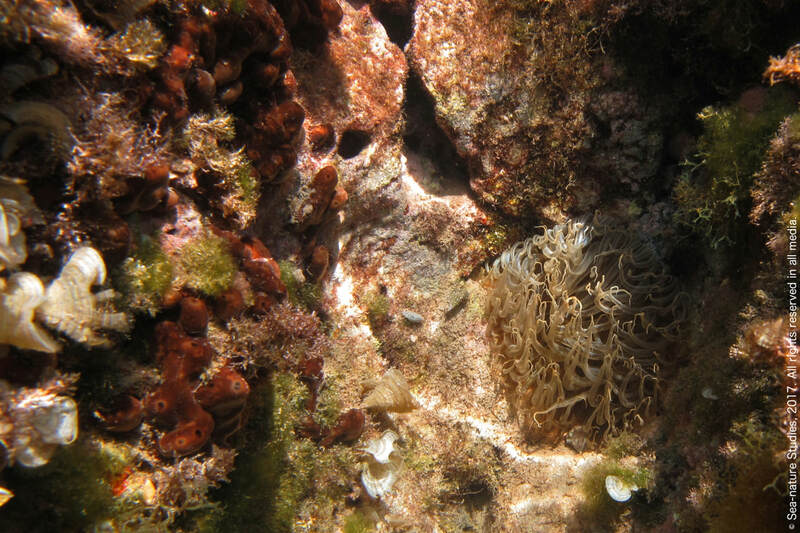 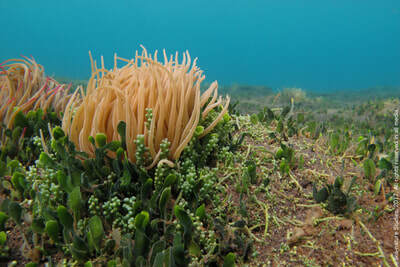 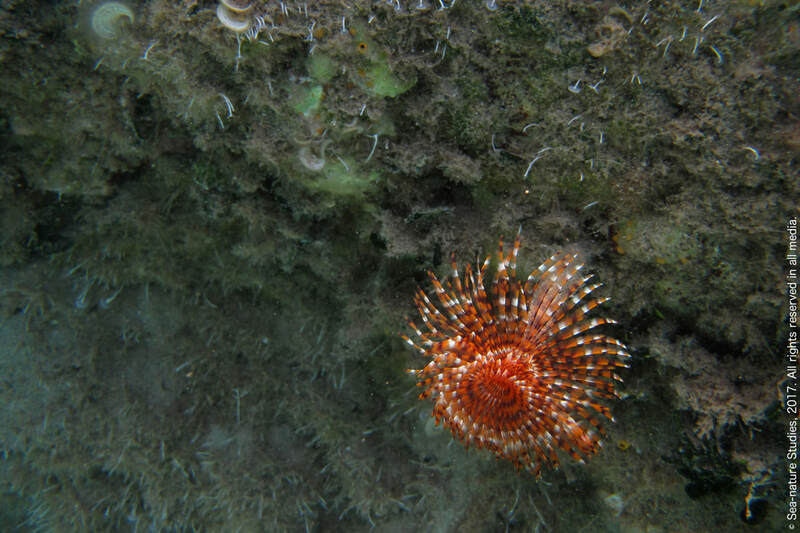 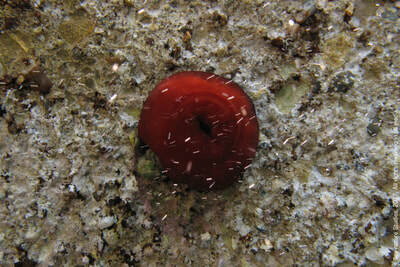 Actinia equina (Linnaeus, 1758), a beadlet anemone. 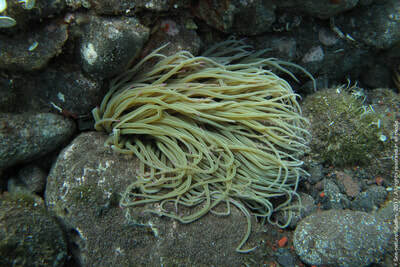 Condylactis aurantiaca (Delle Chiaje, 1825), the golden anemone. 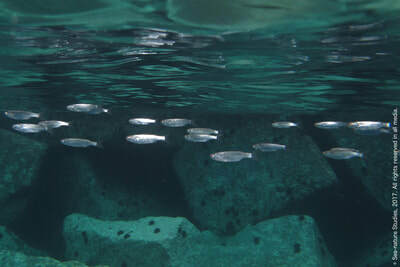 IUCN Red List LC (Least Concern). 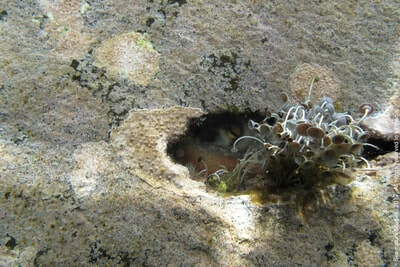 Aiptasia mutabilis (Gravenhorst, 1831), trumpet anemone. 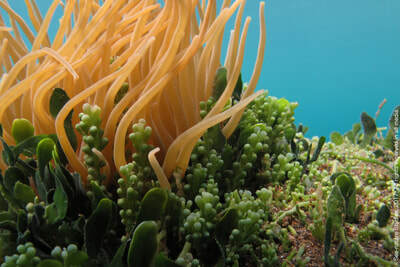 Anemonia viridis (Forsskål, 1775), snakelocks anemone. 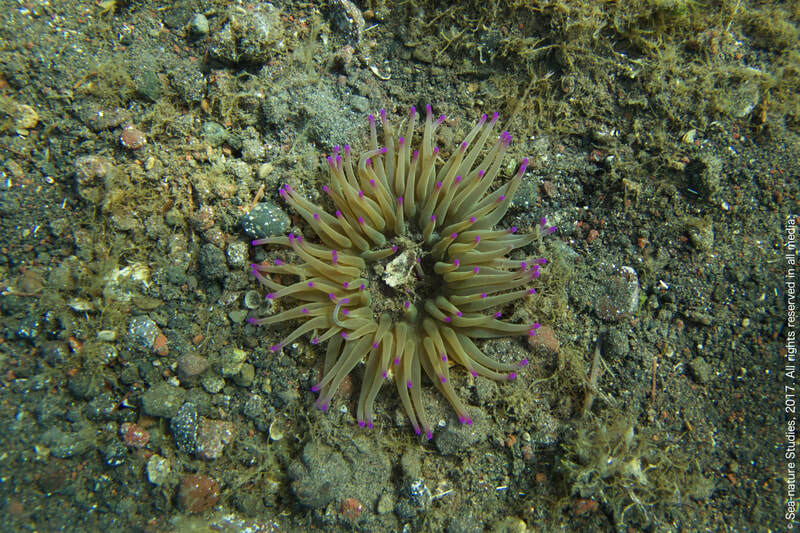 Anemonia viridis (Forsskål, 1775), snakelocks anemone (brown form). 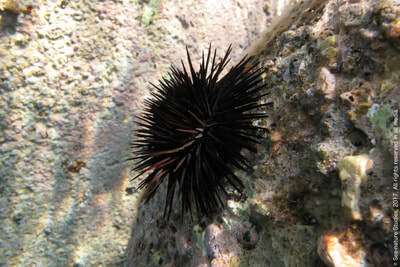 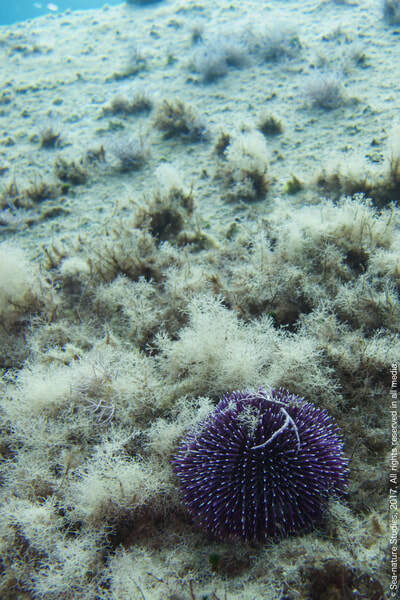 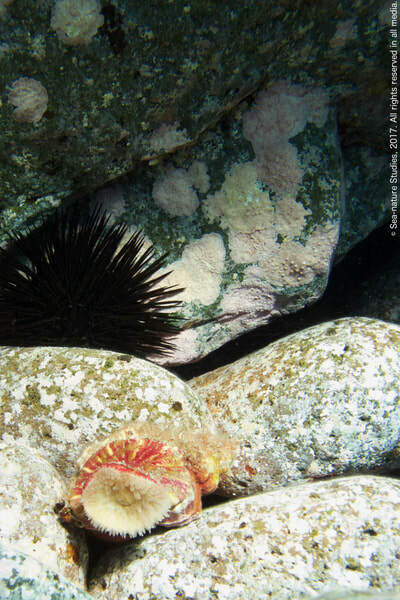 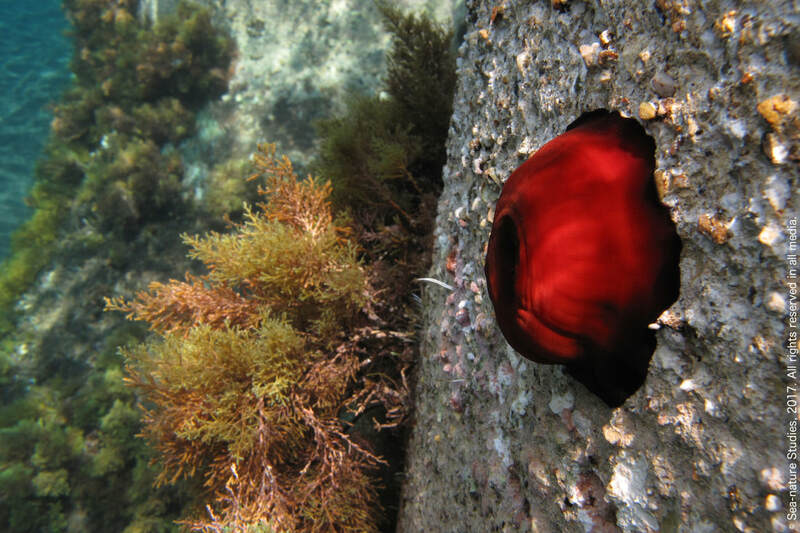 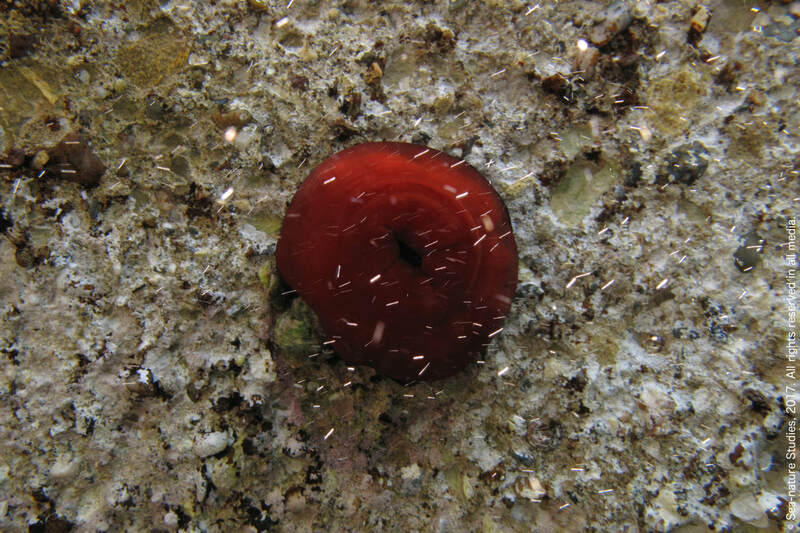 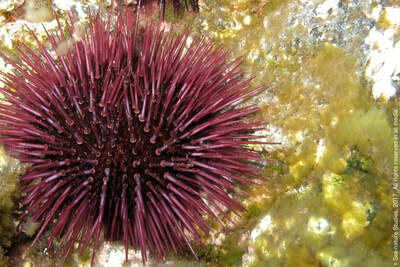 Arbacia lixula (Linnaeus, 1758), the black sea urchin. 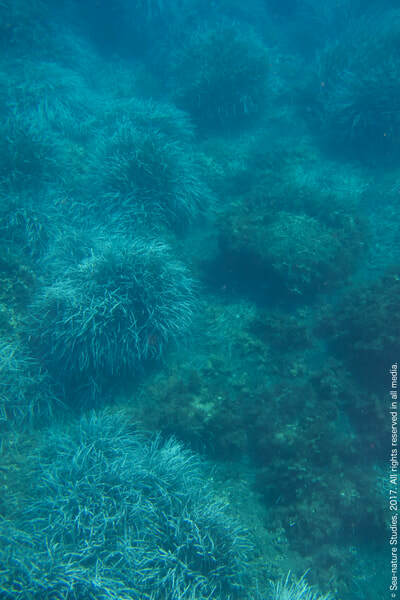 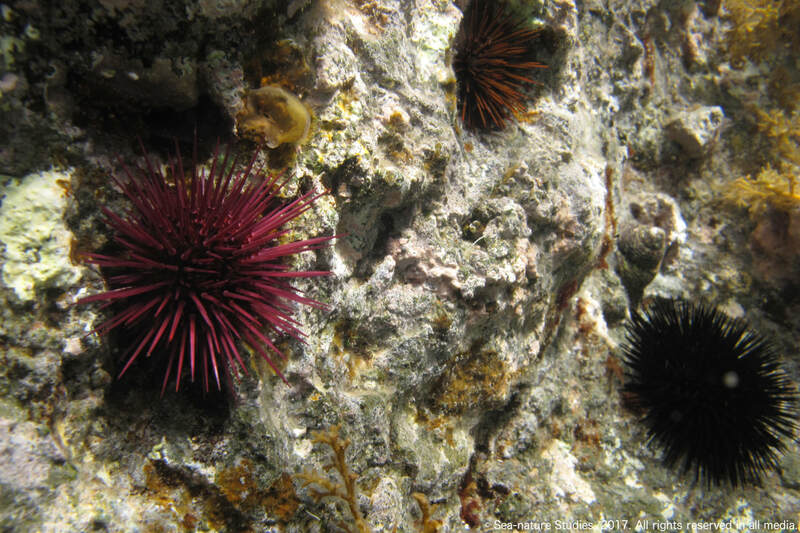 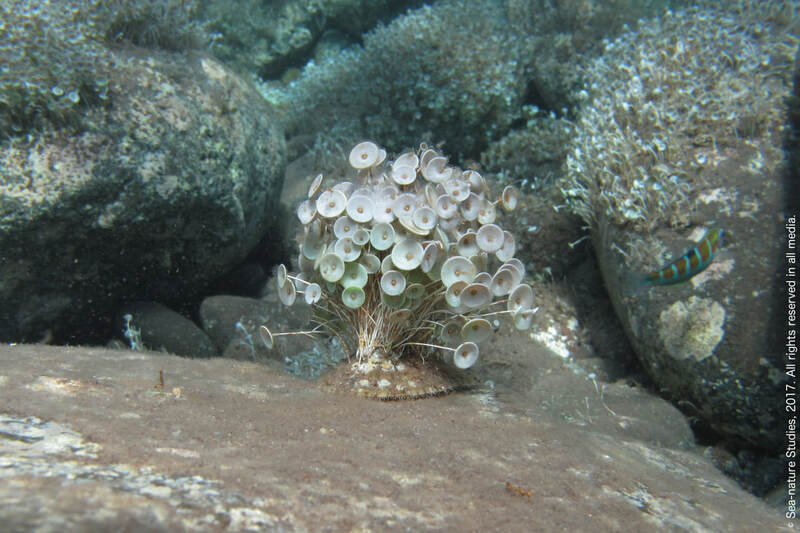 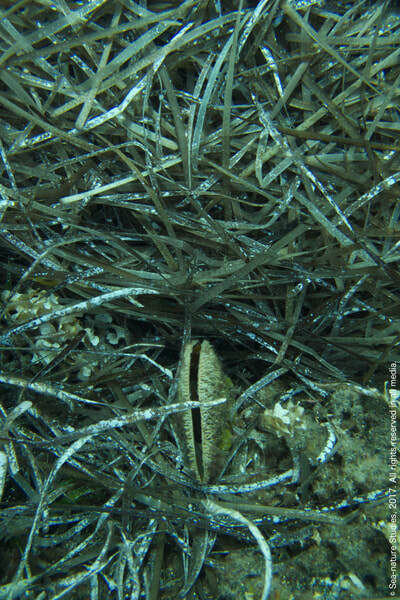 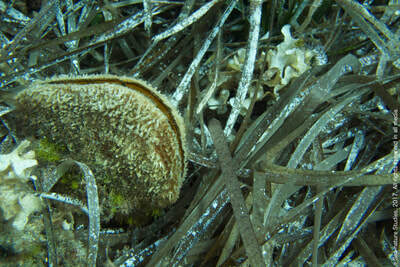 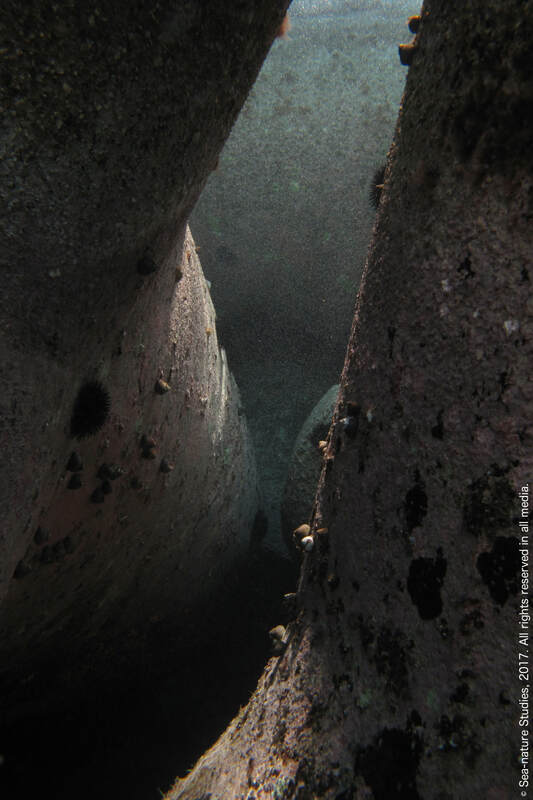 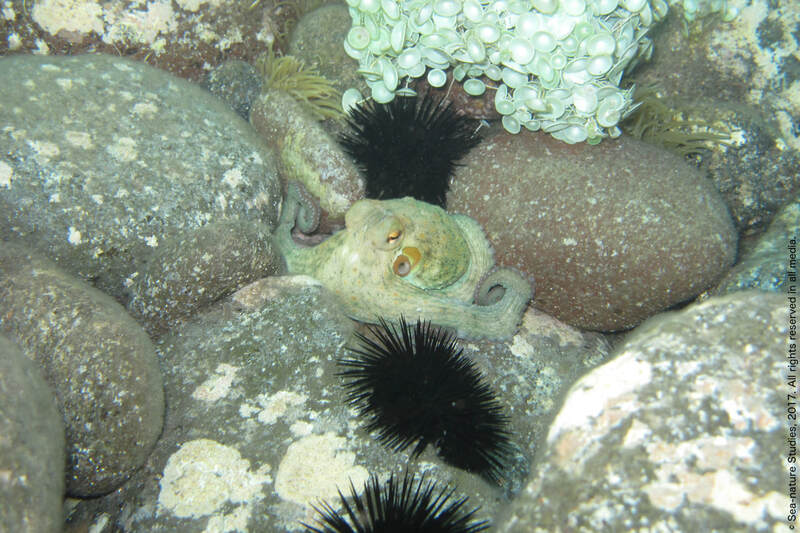 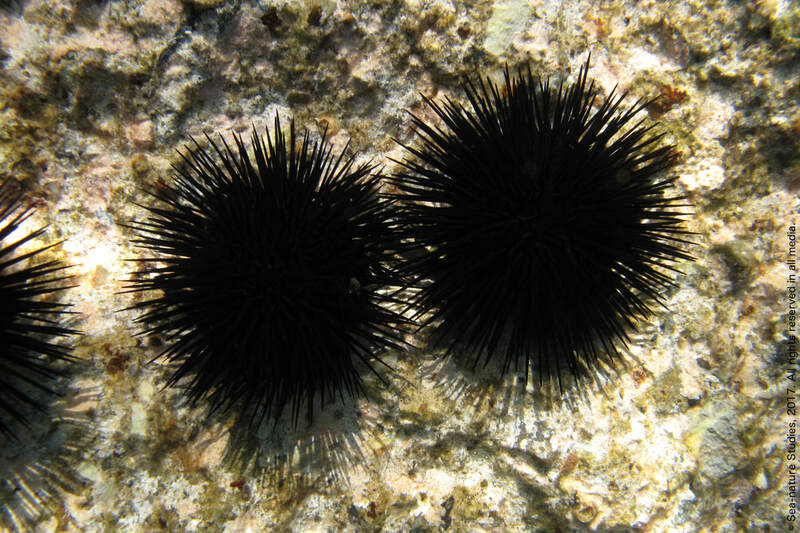 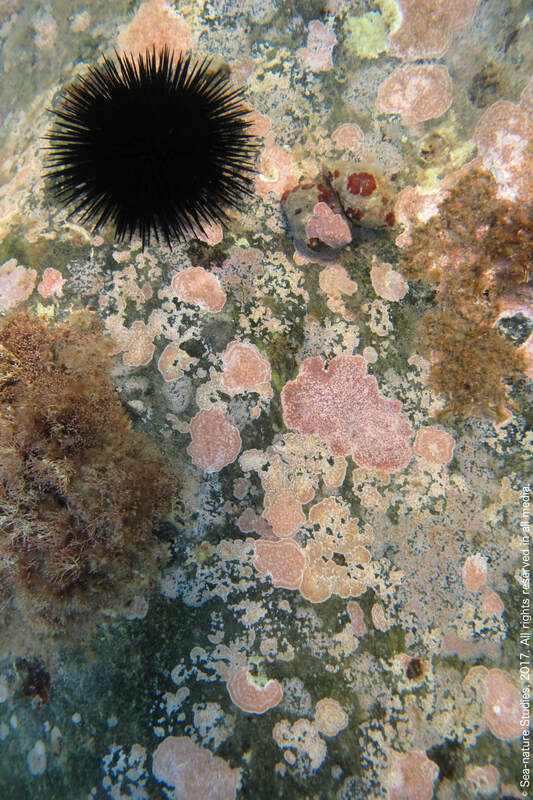 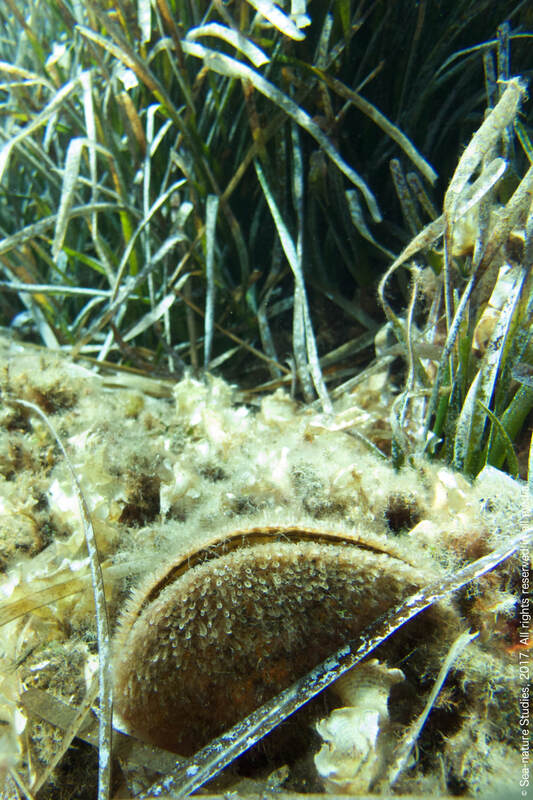 Arbacia lixula (Linnaeus, 1758), black sea urchins. Arca noae Linnaeus, 1758, Noah's Ark shell. 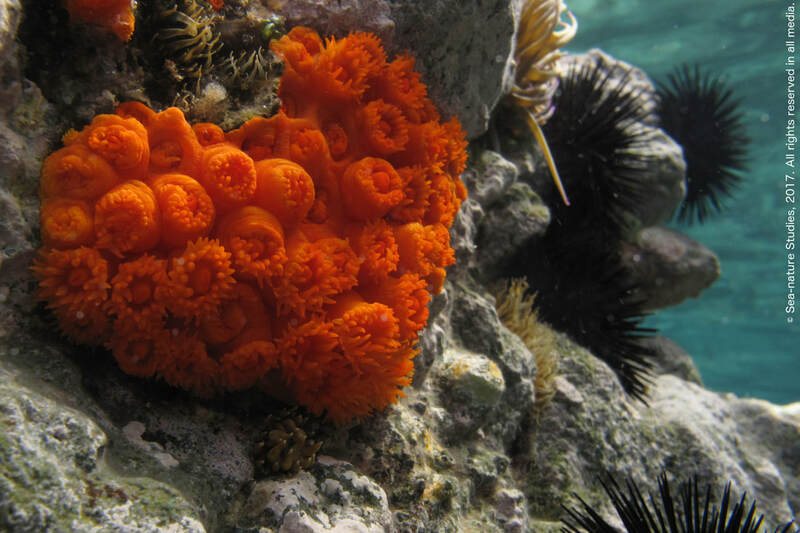 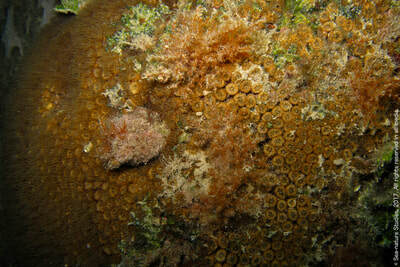 Astroides calycularis (Pallas, 1766), an orange colonial stony cup coral. Bothus podas (Delaroche, 1809), the wide-eyed flounder. 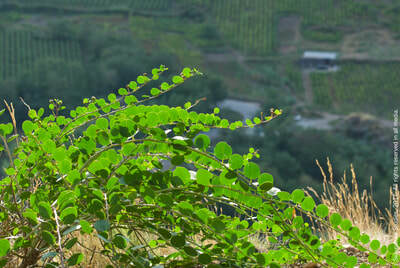 Capparis spinosa Linnaeus 1753, the common caper. 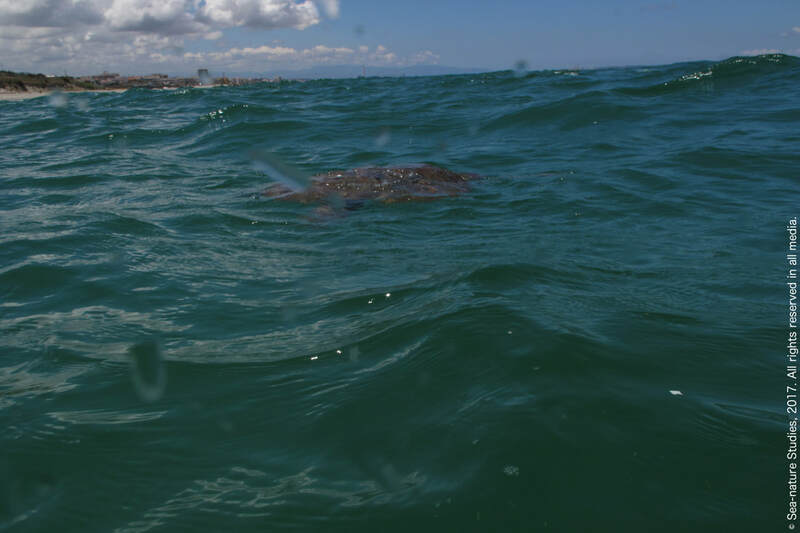 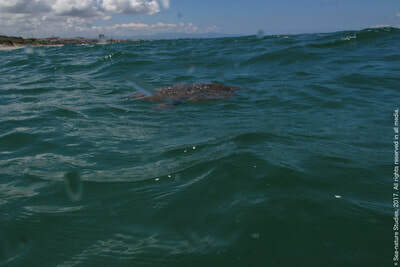 Caretta caretta (Linnaeus, 1758), loggerhead sea turtle! Calliactis parasitica (Couch, 1842), the parasitic anemone. 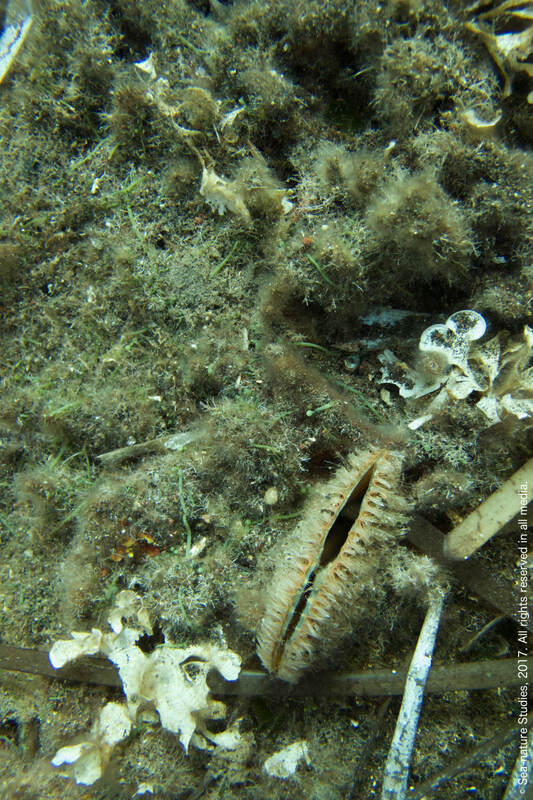 Caulerpa racemosa (Forsskål) J.Agardh, 1873, sea grapes (non-native), side-by-side with Caulerpa prolifera (Forsskål) J.V.Lamouroux, 1809 (native). 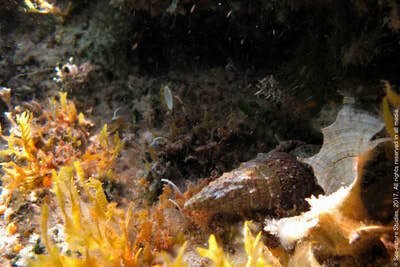 Cerithium vulgatum Bruguière, 1792, sea snail with food (Peacocks tail)! 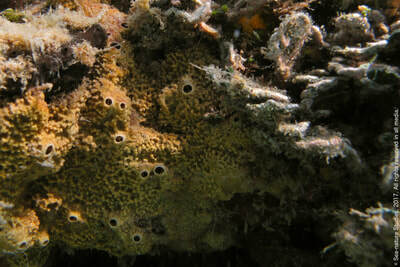 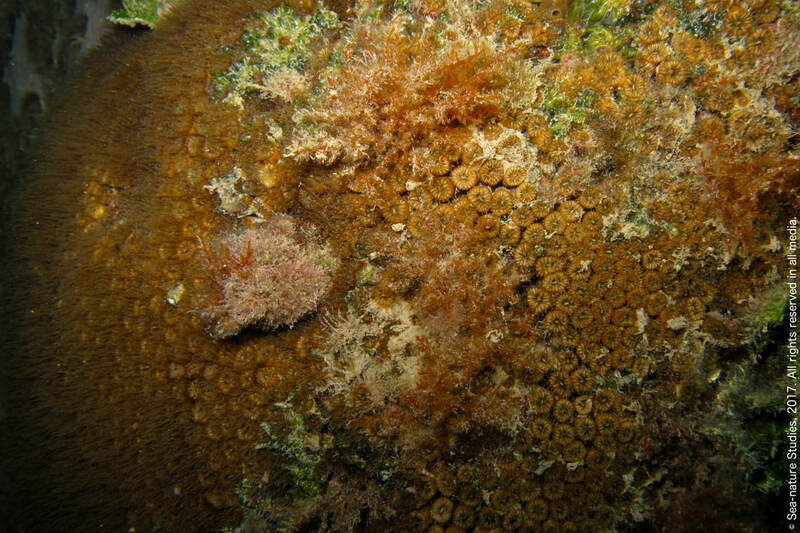 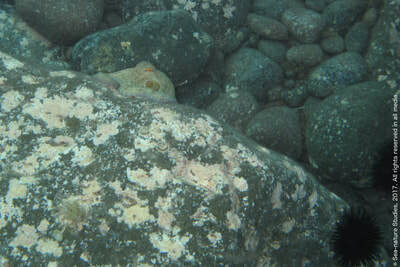 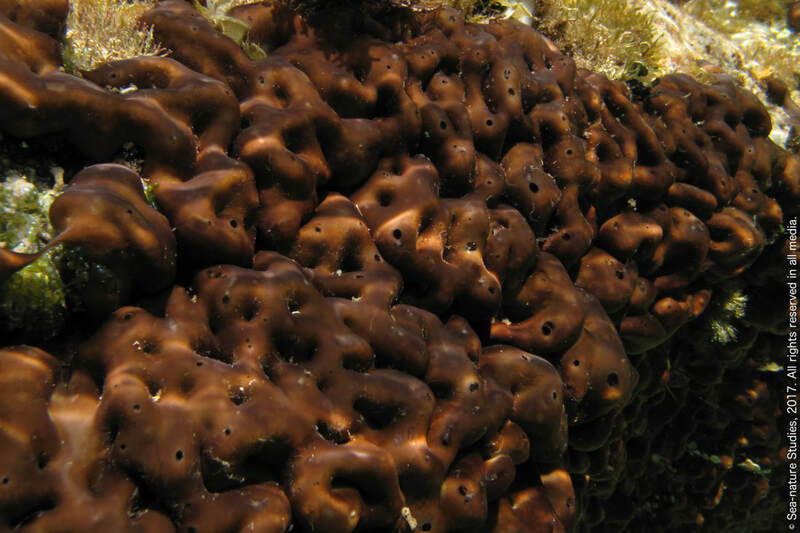 Cladocora caespitosa (Linnaeus, 1767), madrepora pagnotta (Coral loaf). 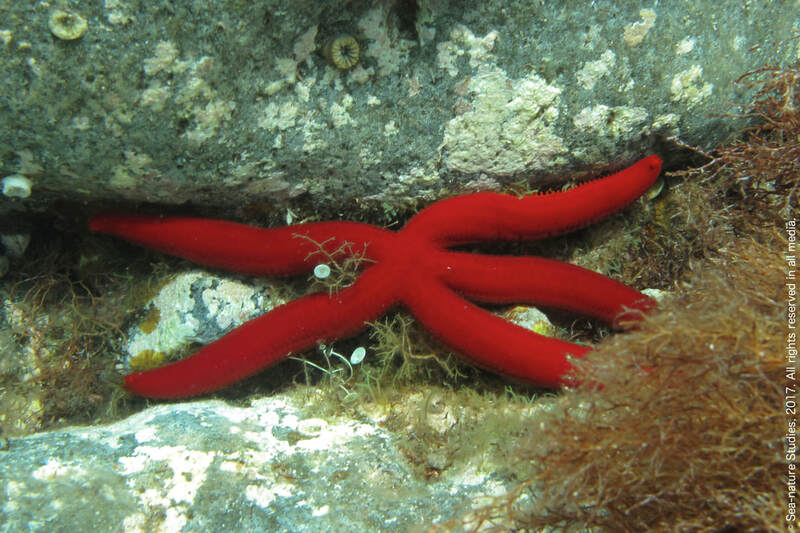 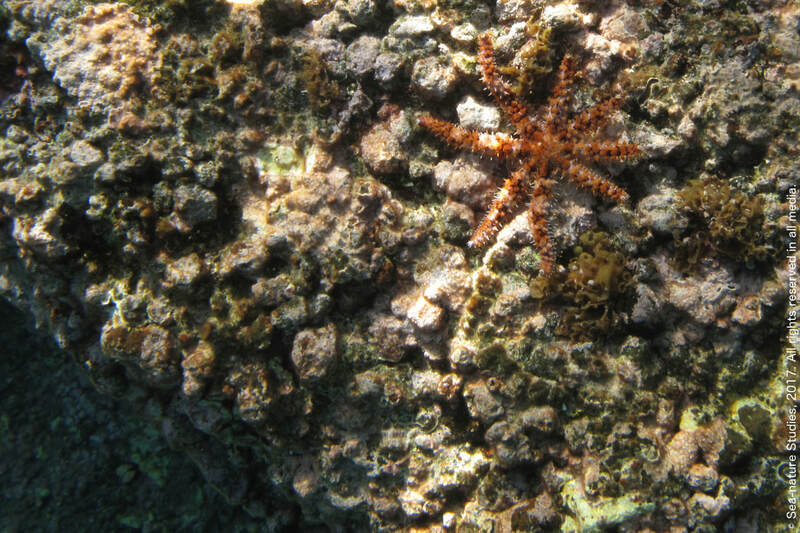 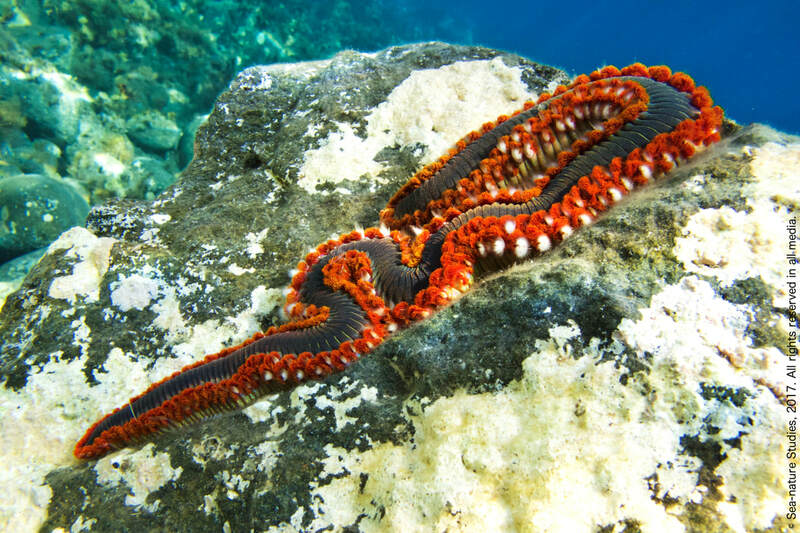 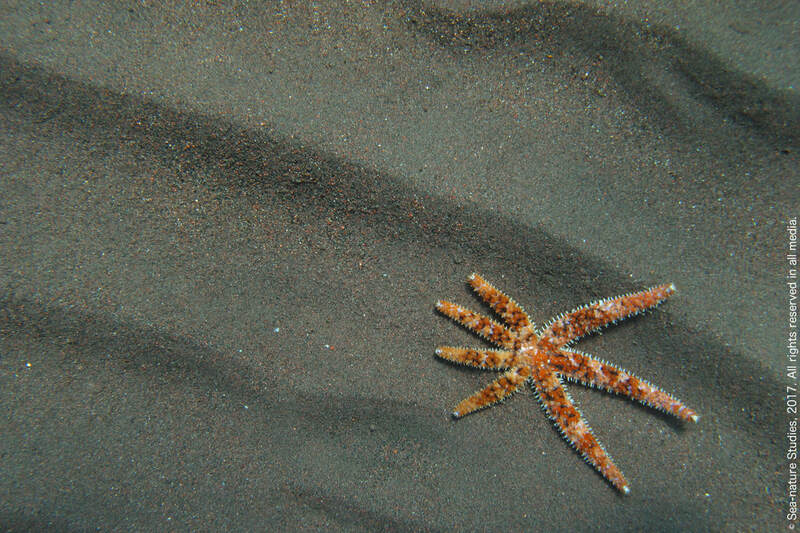 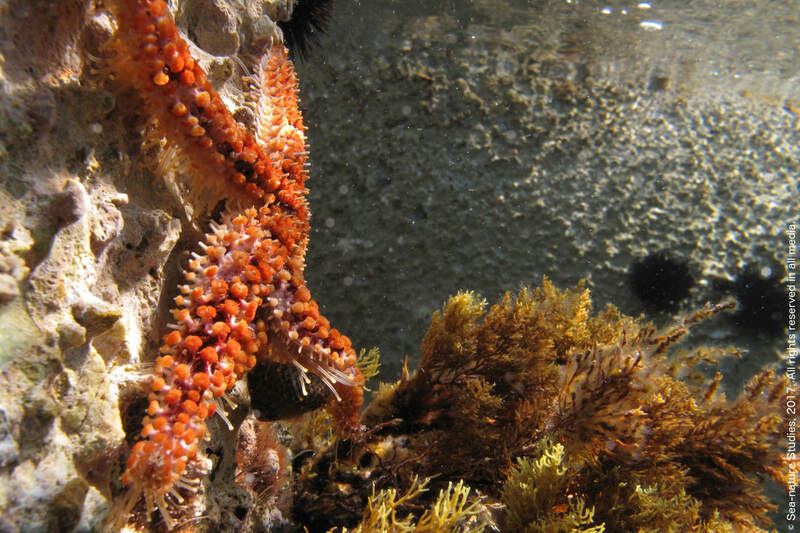 Coscinasterias tenuispina (Lamarck, 1816), a starfish. 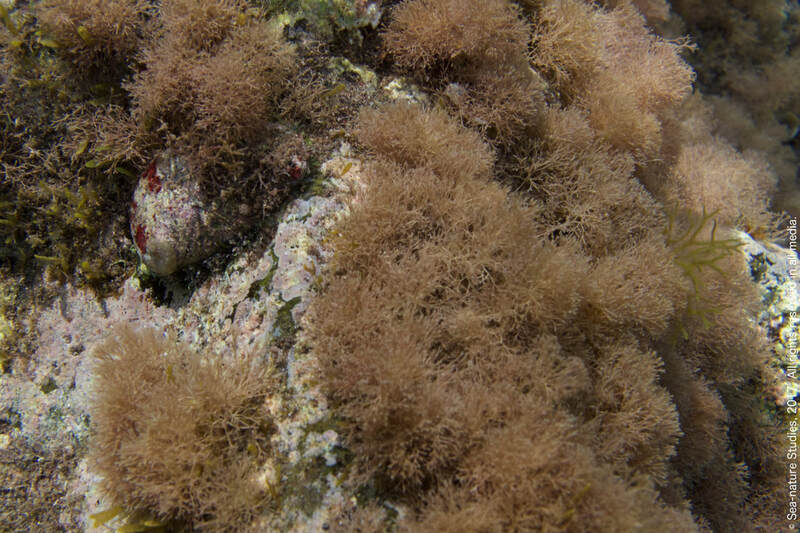 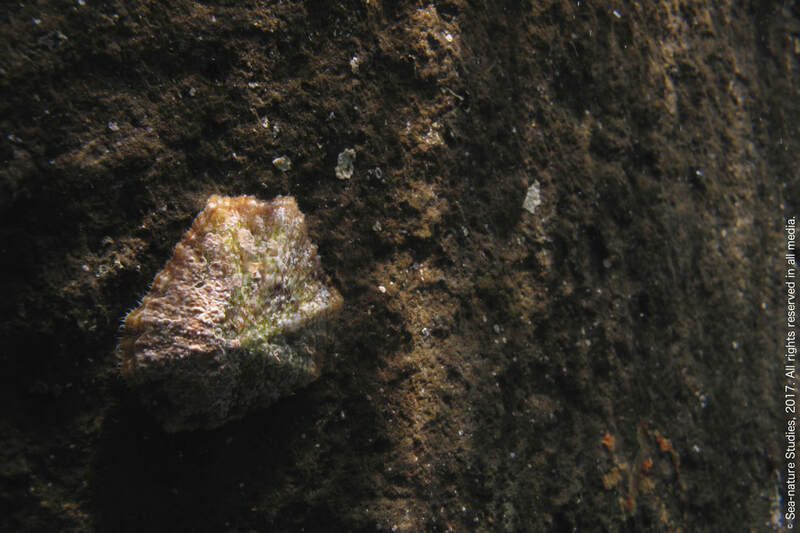 Parablennius gattorugine (Linnaeus, 1758), the tompot blenny. 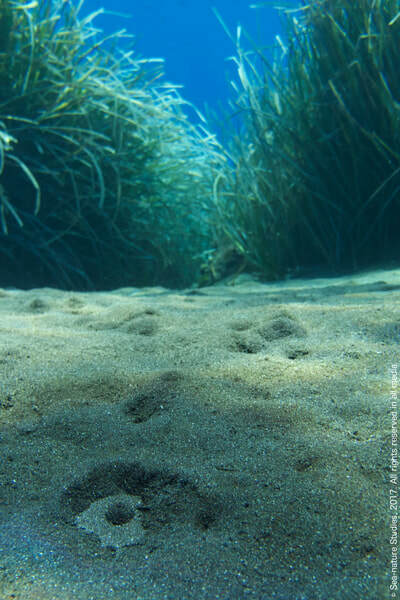 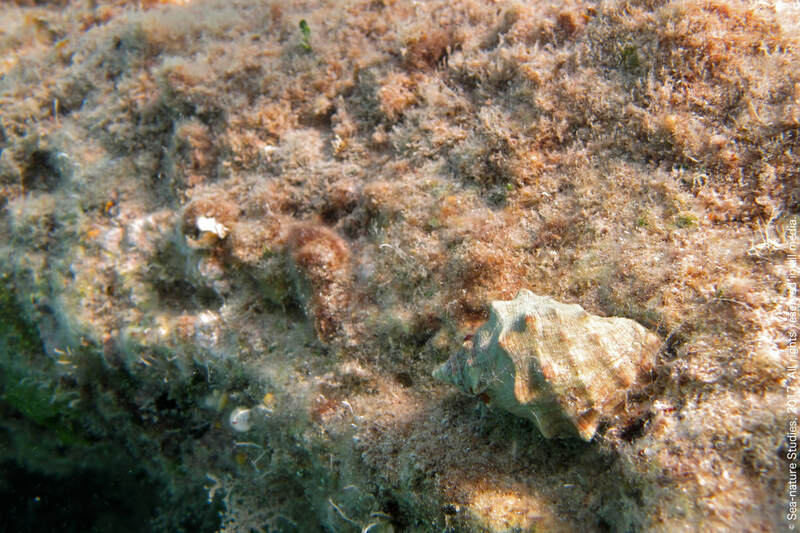 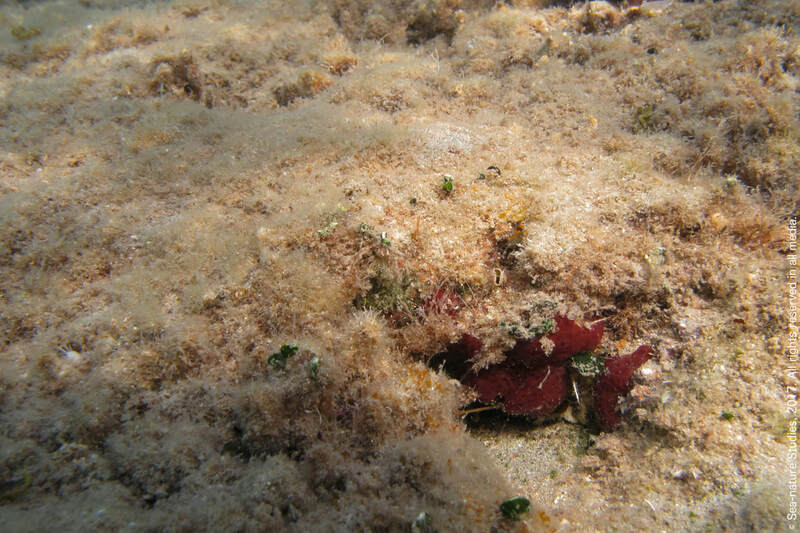 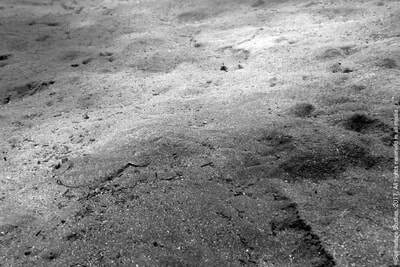 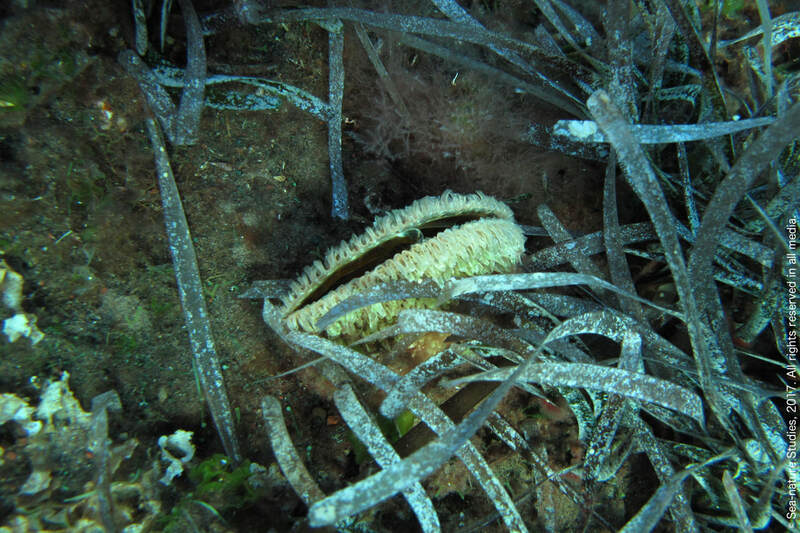 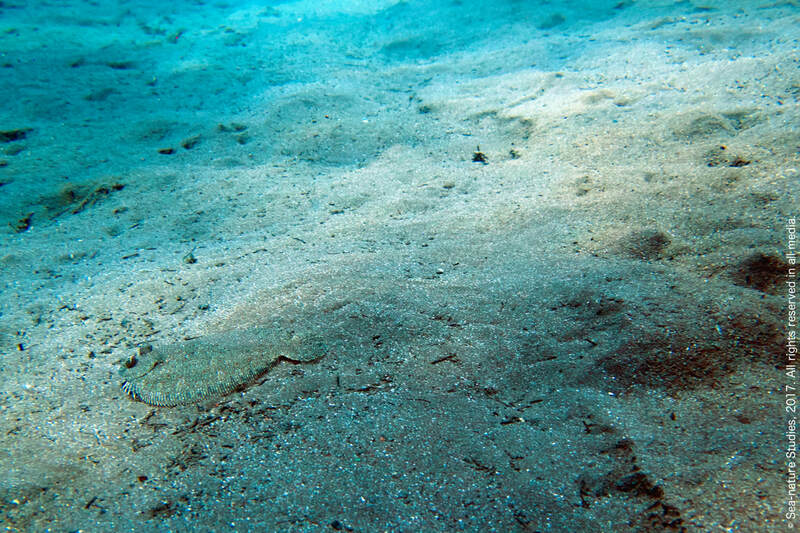 Faunal burrows on sloping sand with Posidonia oceanica behind. Chromis chromis (Linnaeus, 1758), damselfish (foreground). 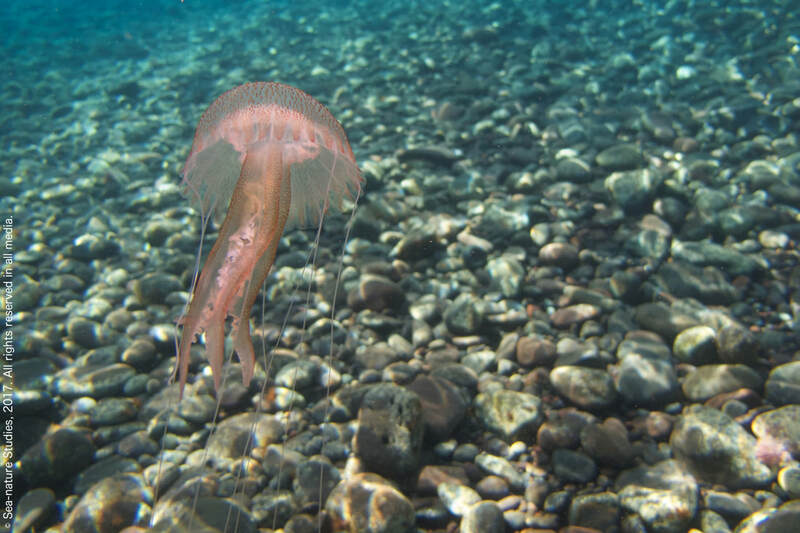 Mugilidae Jarocki, 1822 (unidentified species of mullet). 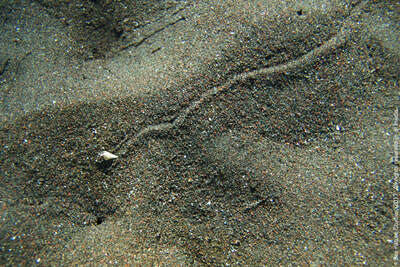 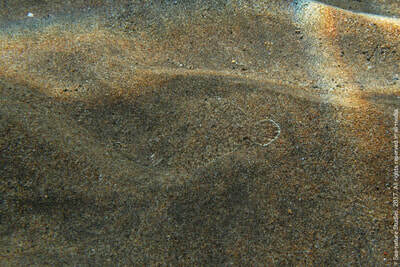 The trail of a tiny unidentified gastropod. 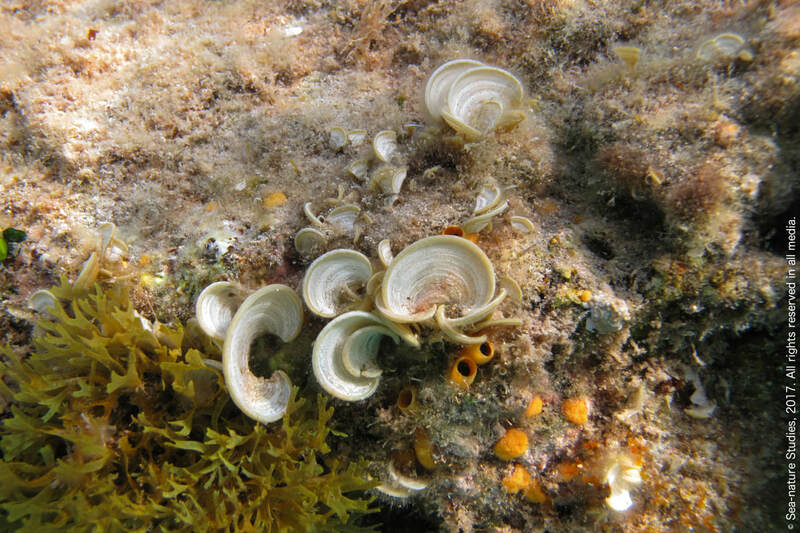 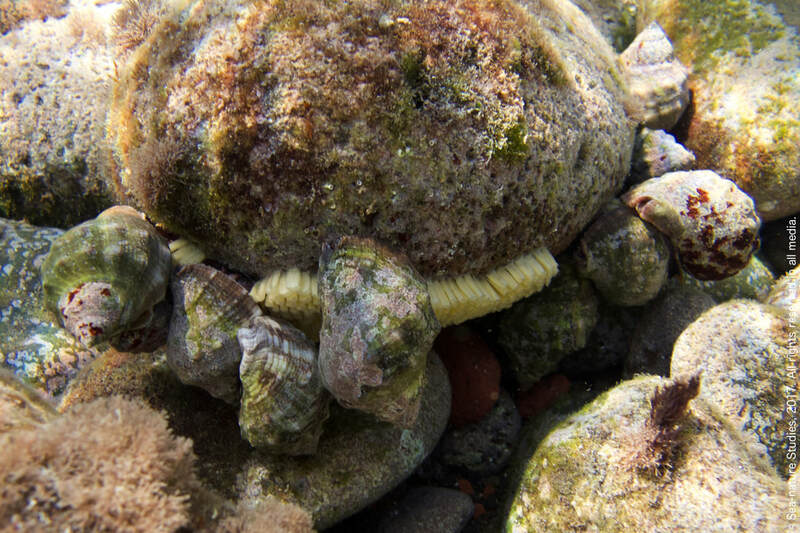 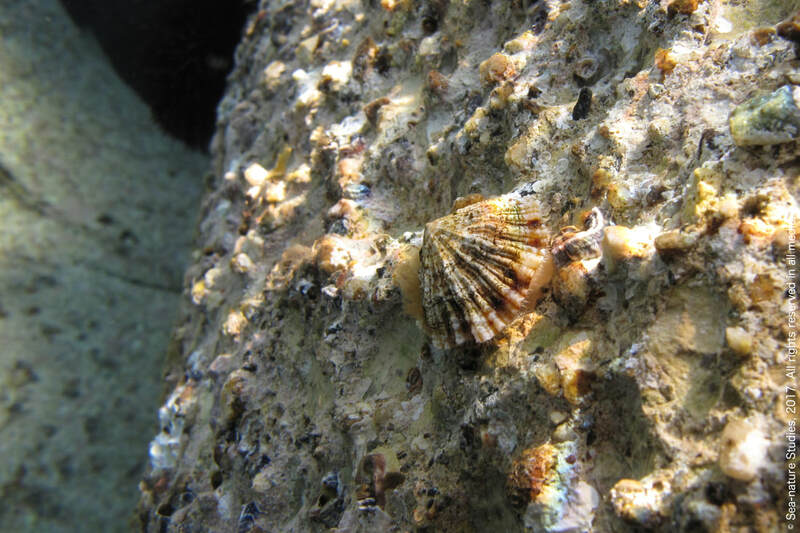 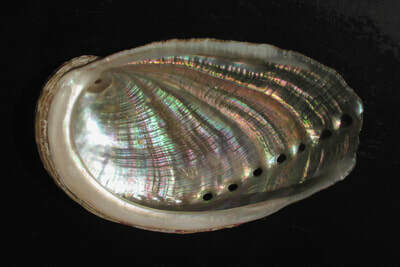 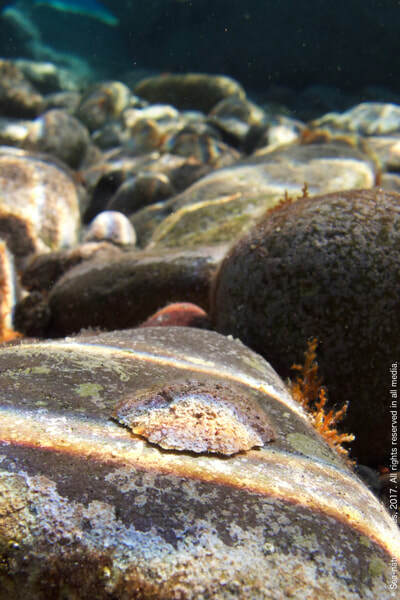 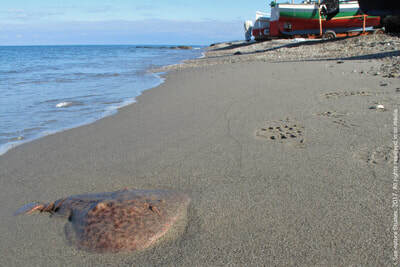 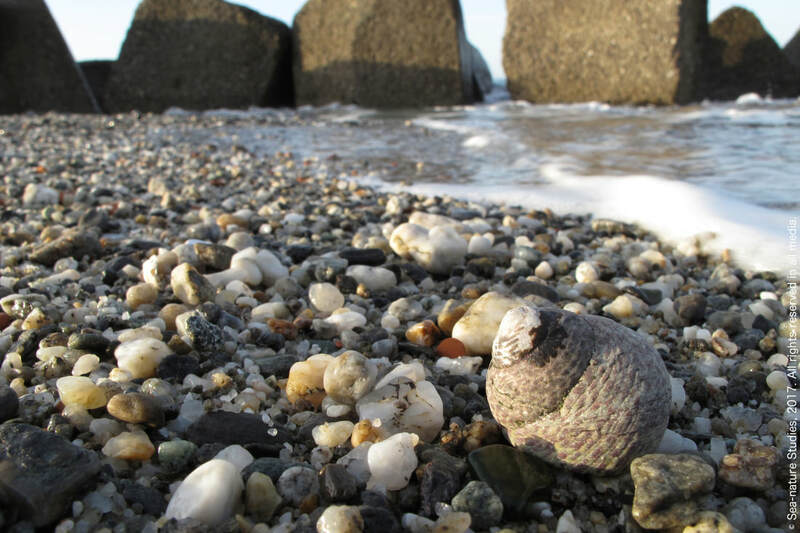 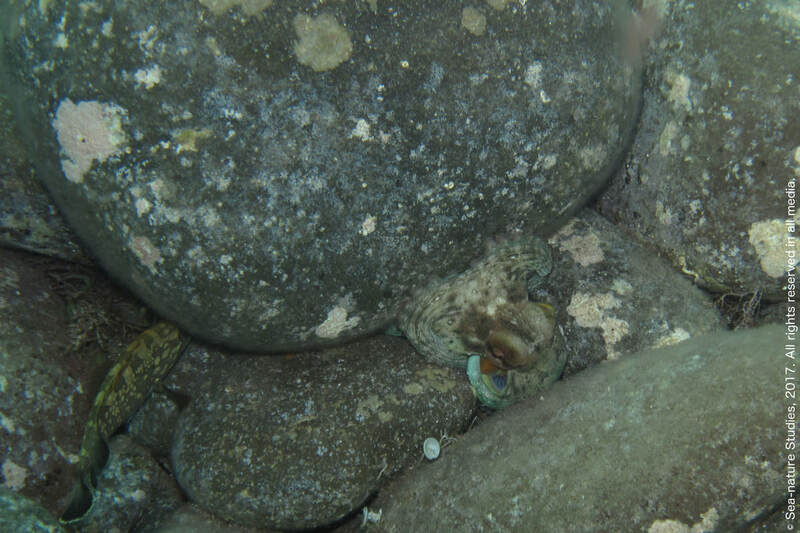 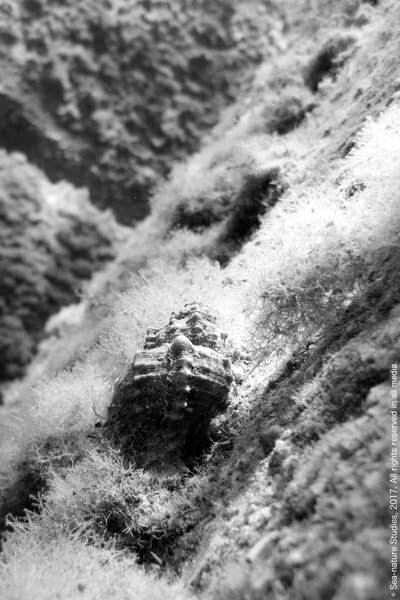 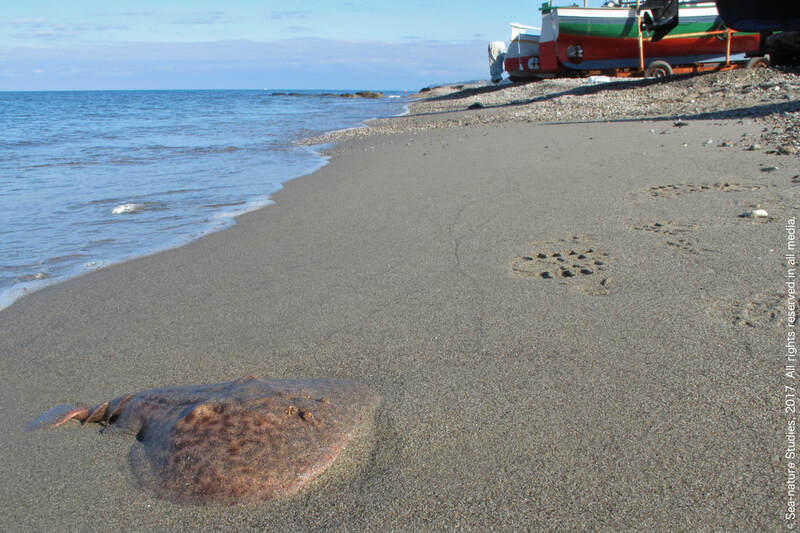 Haliotis tuberculata Linnaeus, 1758, the European abalone or ormer. 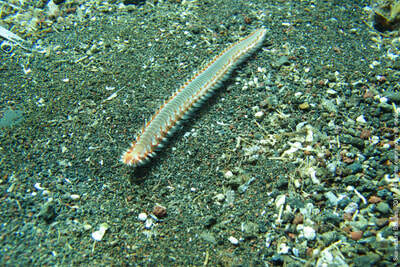 Hermodice carunculata (Pallas, 1766), the bearded fireworm. 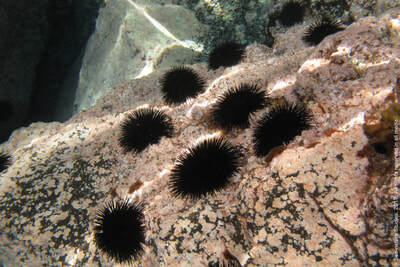 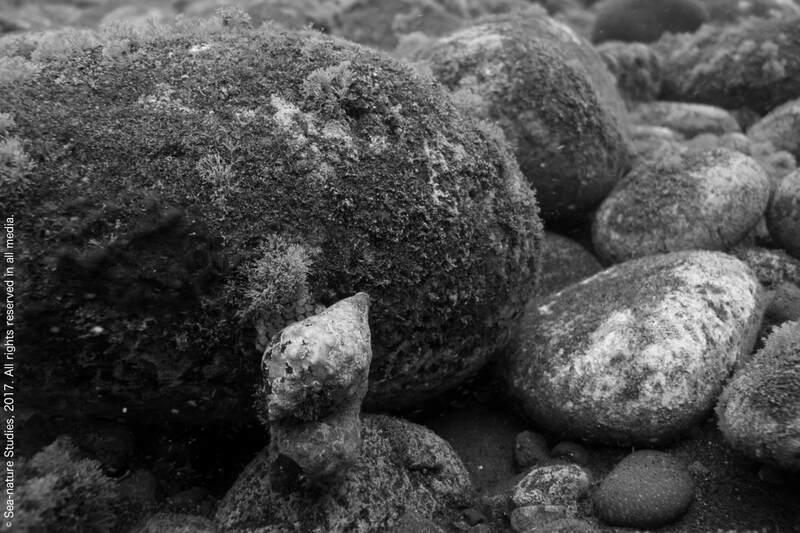 Tetrapod barriere di scogli - Hidden habitats. 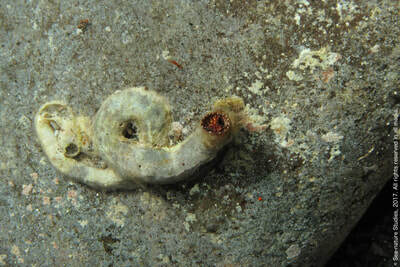 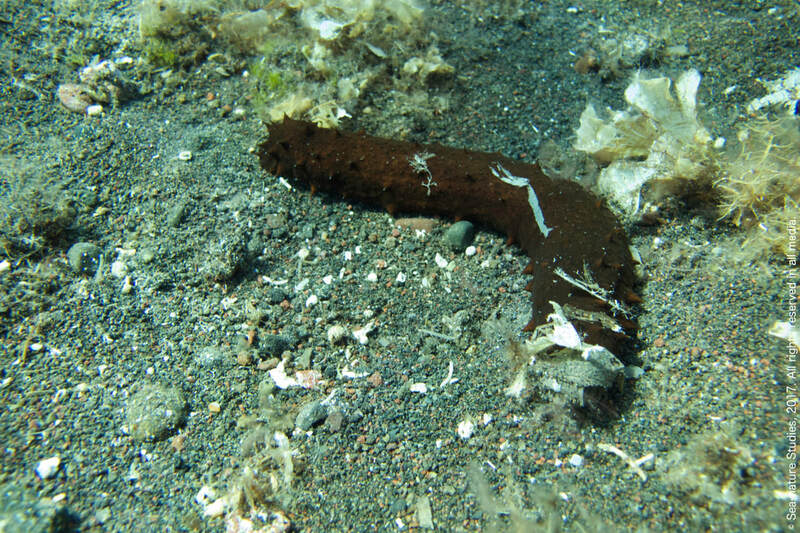 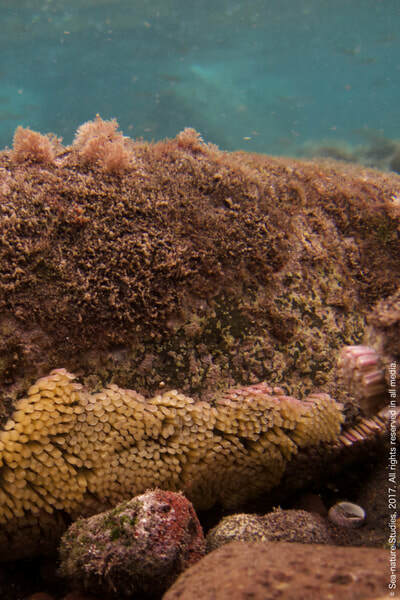 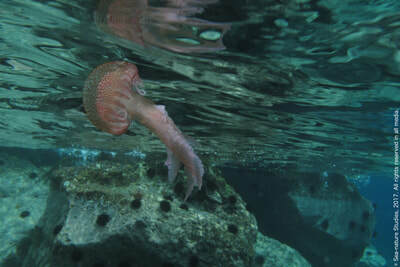 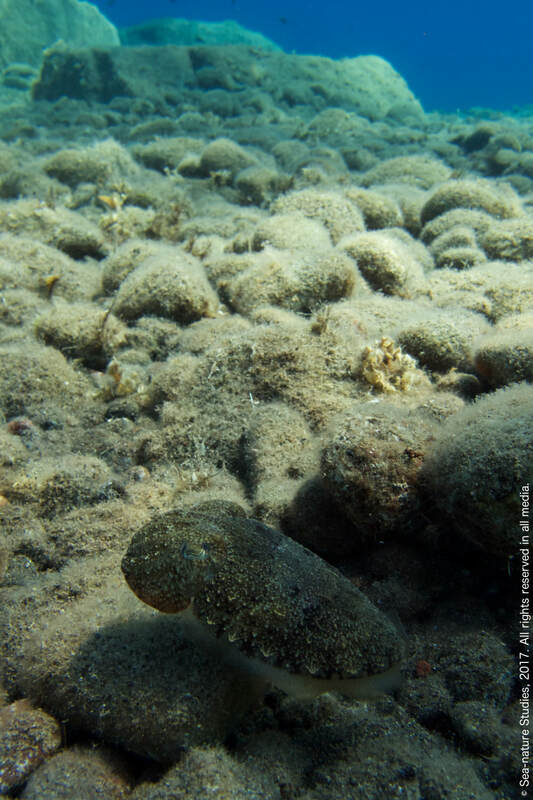 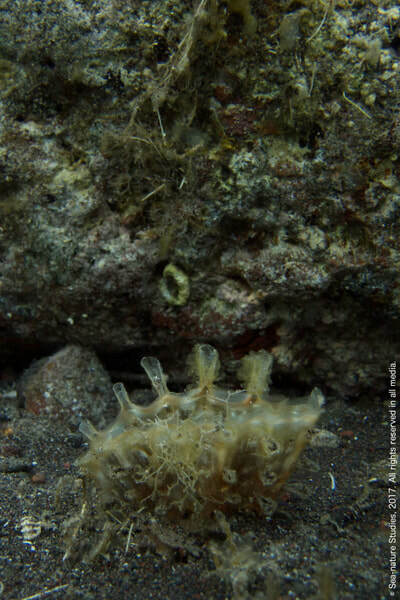 Holothuria Linnaeus, 1767, a sea cucumber (species designation not possible). 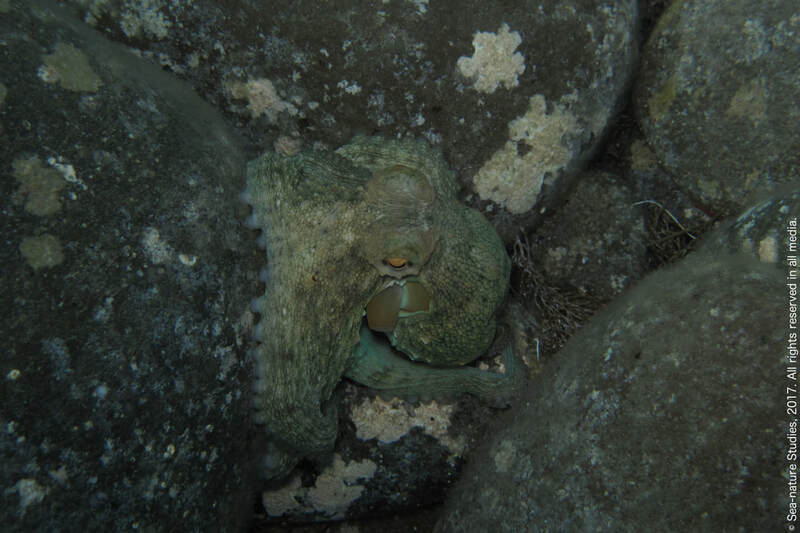 Octopus vulgaris Cuvier, 1797, the common octopus. 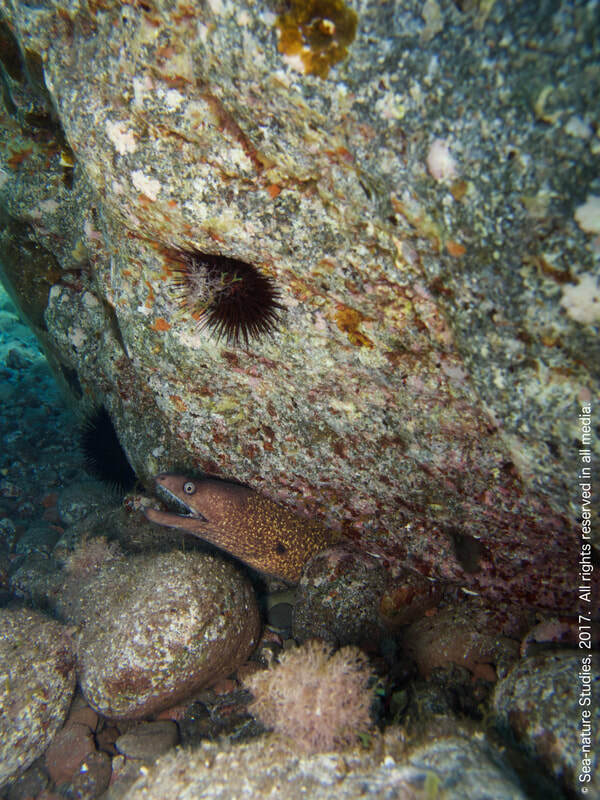 Muraena helena Linnaeus, 1758, the Mediterranean moray eel. Ophidiaster ophidianus (Lamarck, 1816), la stella serpente. 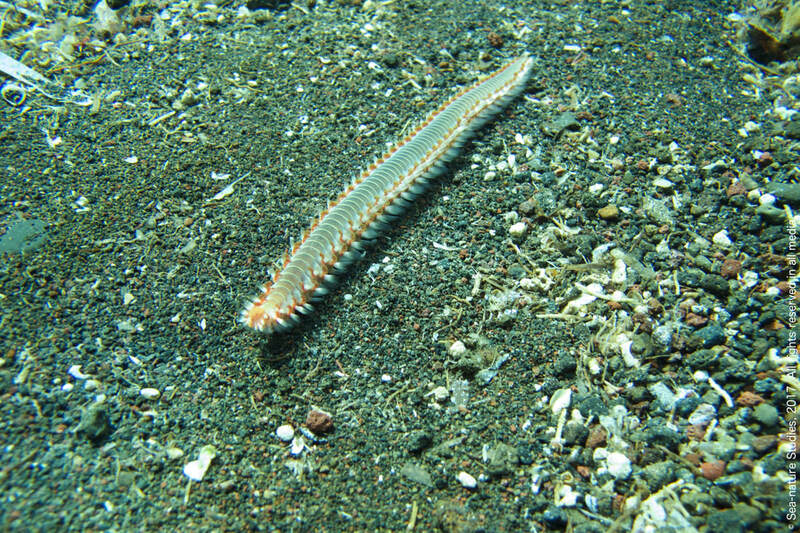 Padina pavonica (Linnaeus) Thivy, 1960, peacocks tail. 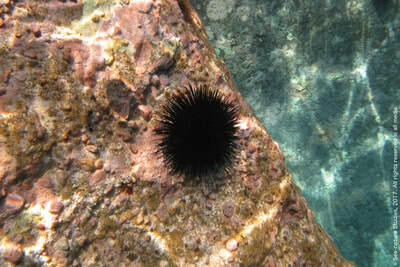 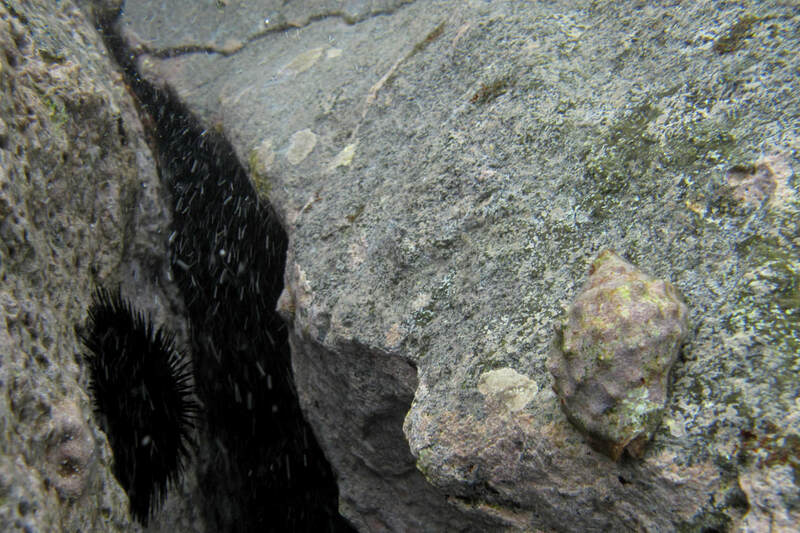 Paracentrotus lividus (Lamarck, 1816), the rock sea urchin. 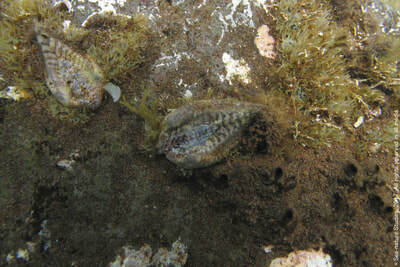 Patella caerulea Linnaeus, 1758, the rayed Mediterranean limpet. 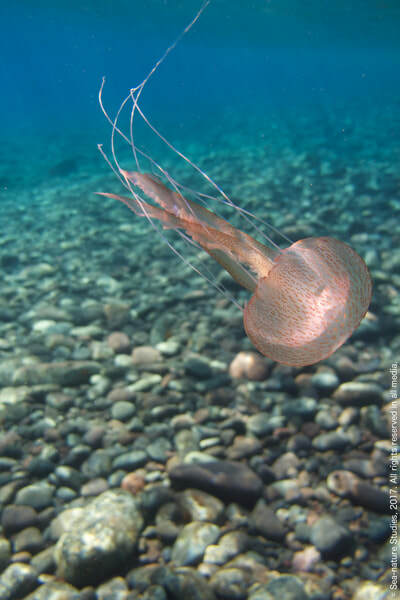 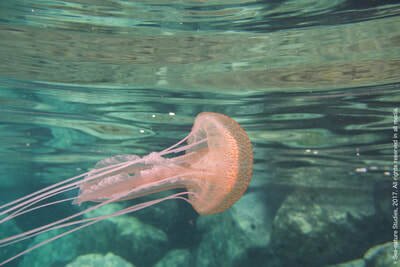 Pelagia noctiluca (Forsskål, 1775), the mauve stinger. Phorcus turbinatus (Born, 1778), trottola. 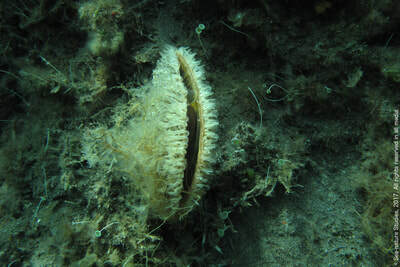 Pinna nobilis Linnaeus, 1758, fan mussel. 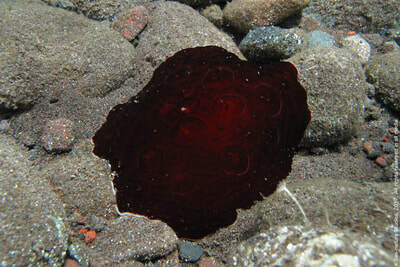 Pleurobranchus testudinarius Cantraine, 1835, the turtle snail. 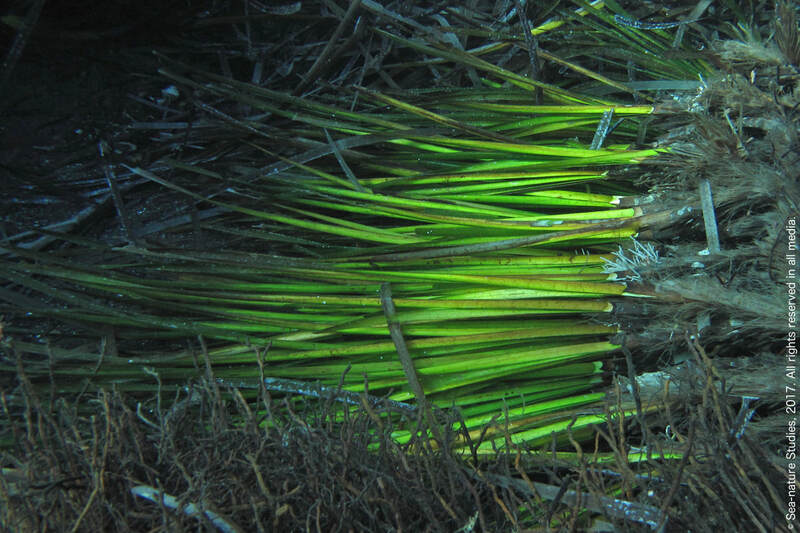 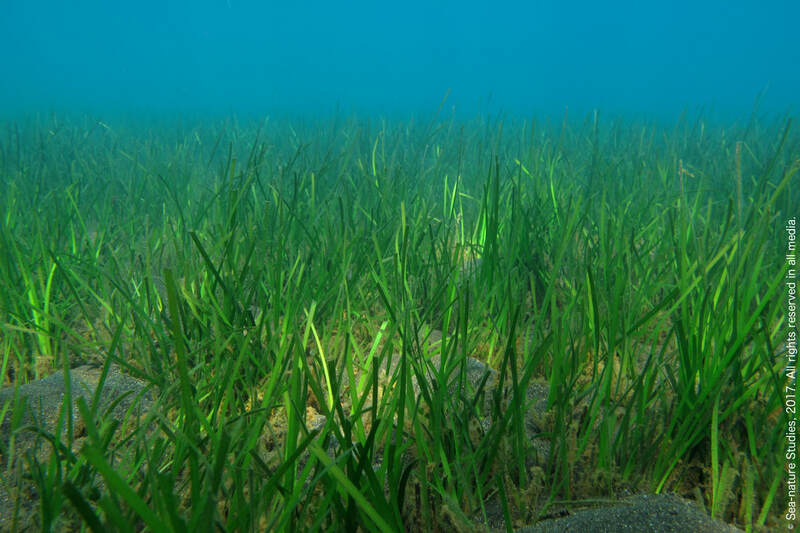 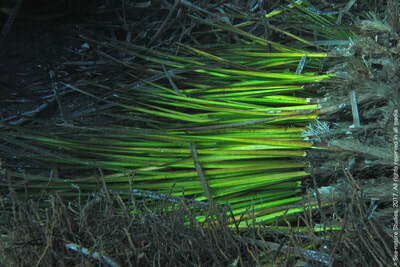 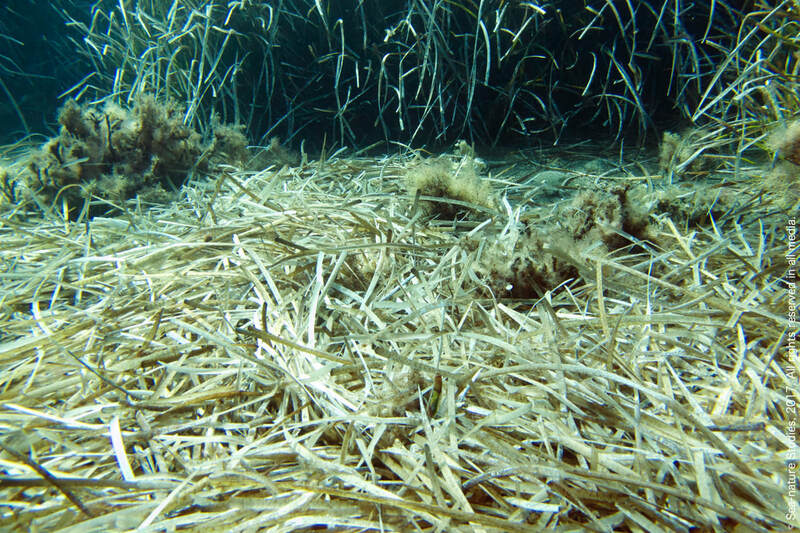 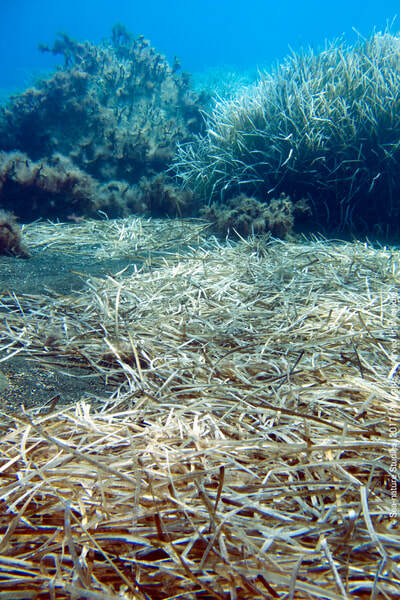 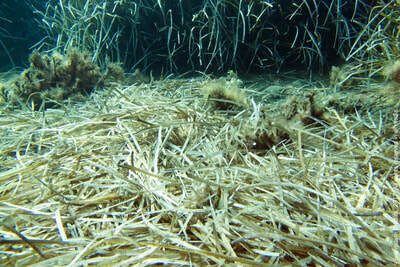 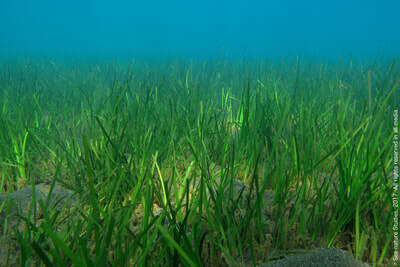 Posidonia oceanica (Linnaeus) Delile, 1813, Neptune grass. 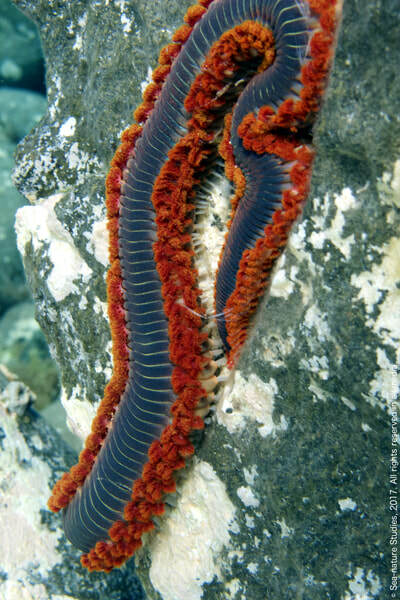 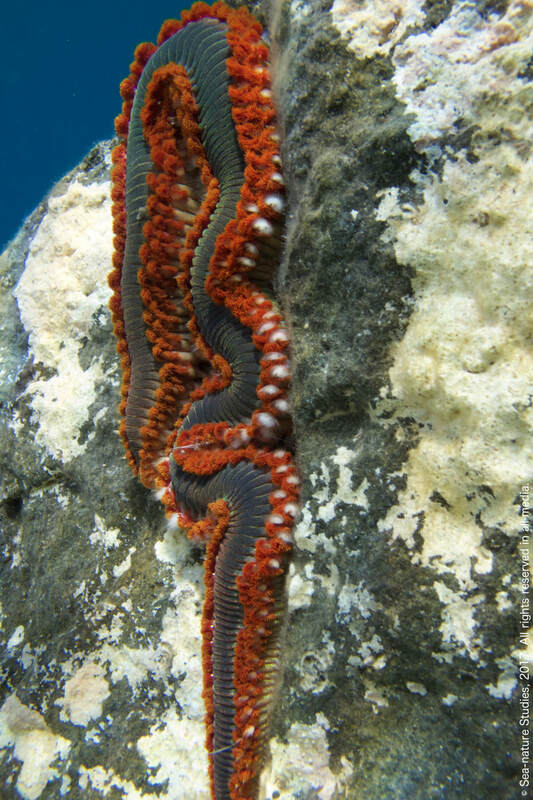 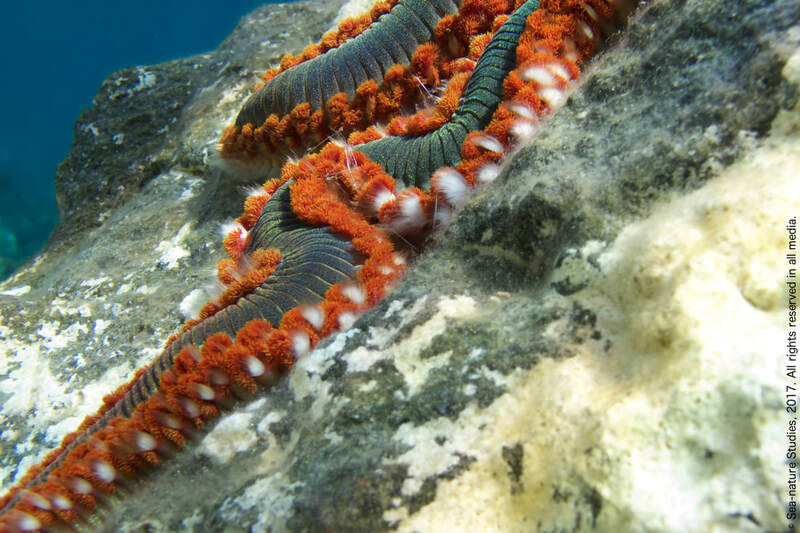 Sabella spallanzanii (Gmelin, 1791), the European fan worm. 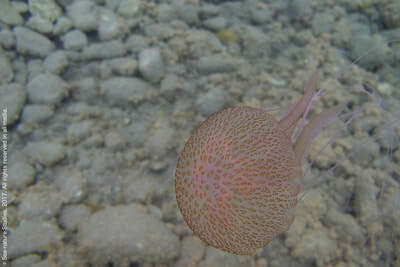 Sepia officinalis Linnaeus, 1758, the European common cuttlefish. 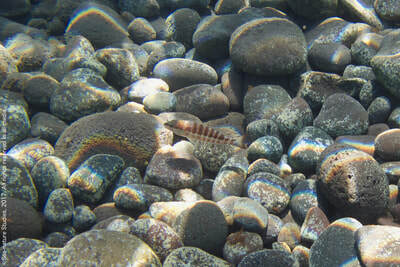 Serranus cabrilla (Linnaeus, 1758), the comber. 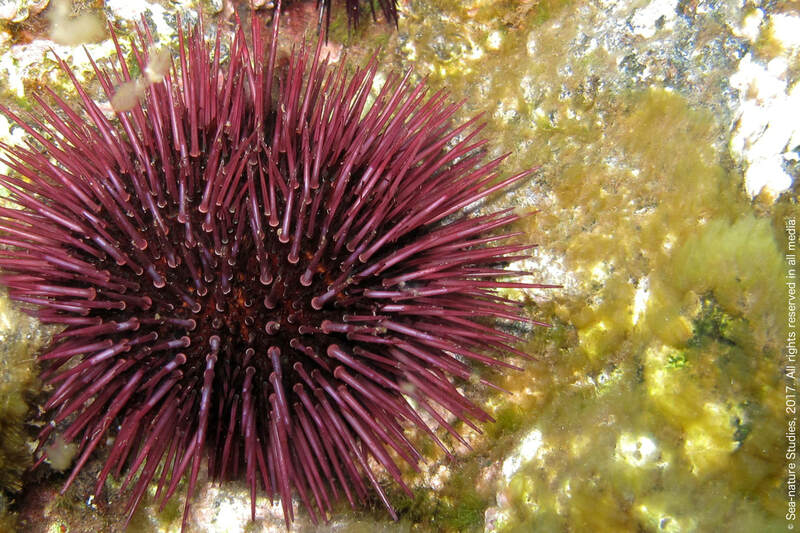 Sphaerechinus granularis (Lamarck, 1816), the purple sea urchin. Stramonita haemastoma (Linnaeus, 1767), a rock shell. 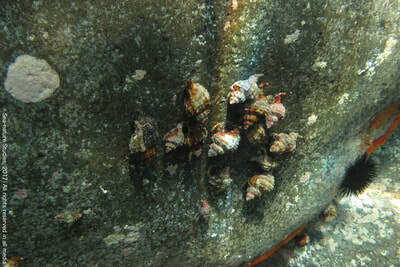 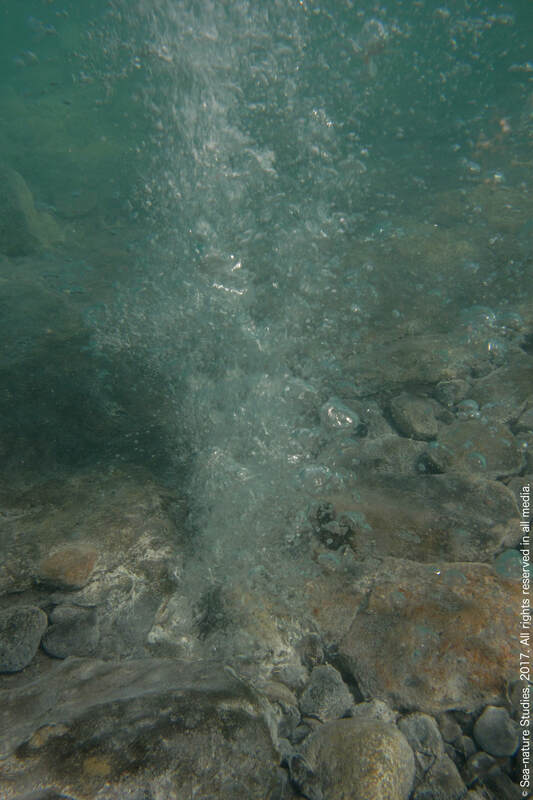 Stramonita haemastoma (Linnaeus, 1767), rock shells reproducing. Stramonita haemastoma (Linnaeus, 1767), rock shells egg capsules. 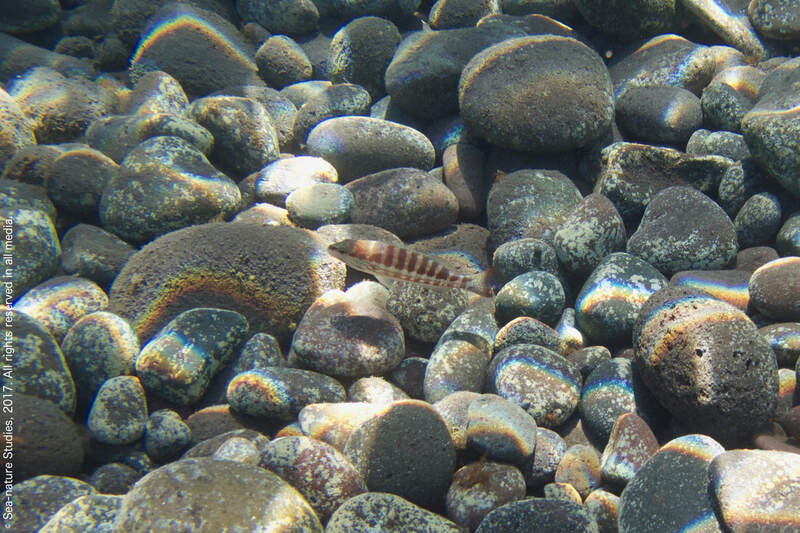 Symphodus ocellatus (Linnaeus, 1758), the ocellated wrasse. Nesting male with female below. 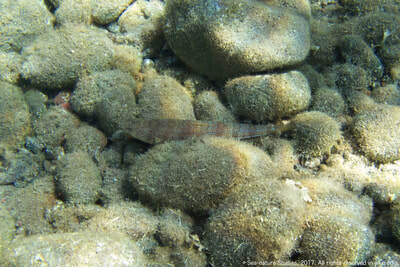 Synodus saurus (Linnaeus, 1758), the Atlantic lizardfish. 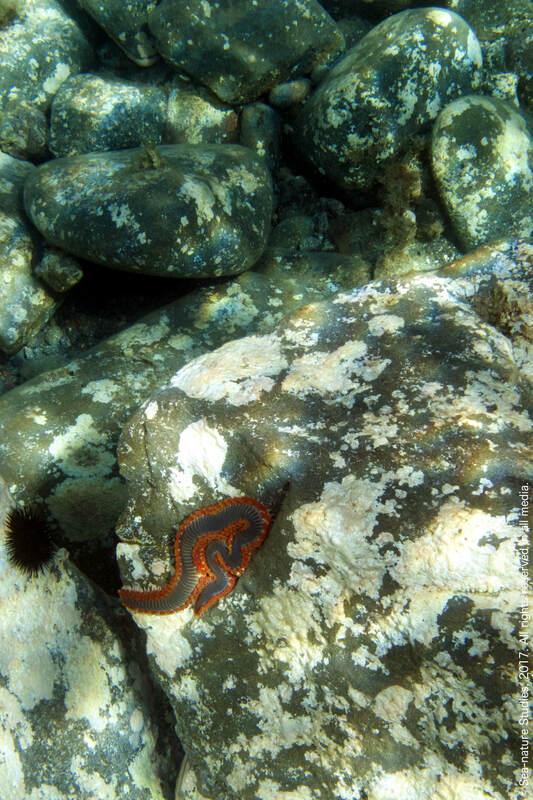 Thylacodes arenarius (Linnaeus, 1758), the giant worm shell. 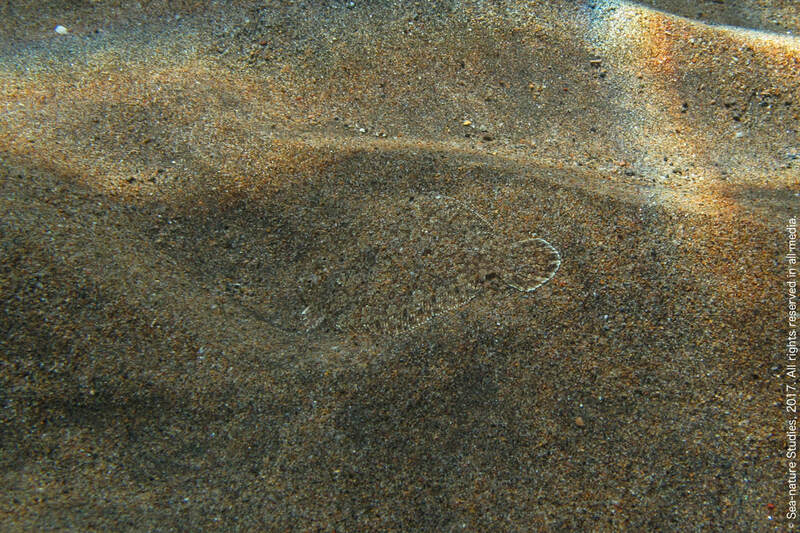 Torpedo marmorata Risso, 1810, the marbled electric ray. 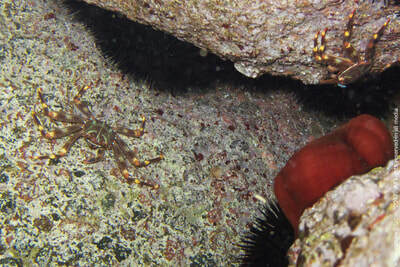 Percnon gibbesi (H. Milne Edwards, 1853), the Sally lightfoot crab. 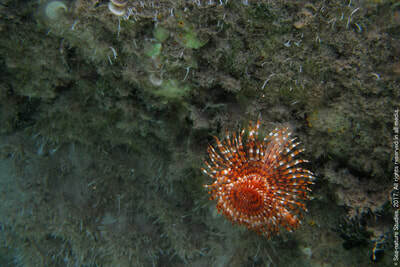 Hexaplex trunculus (Linnaeus, 1758), the banded dye-murex. 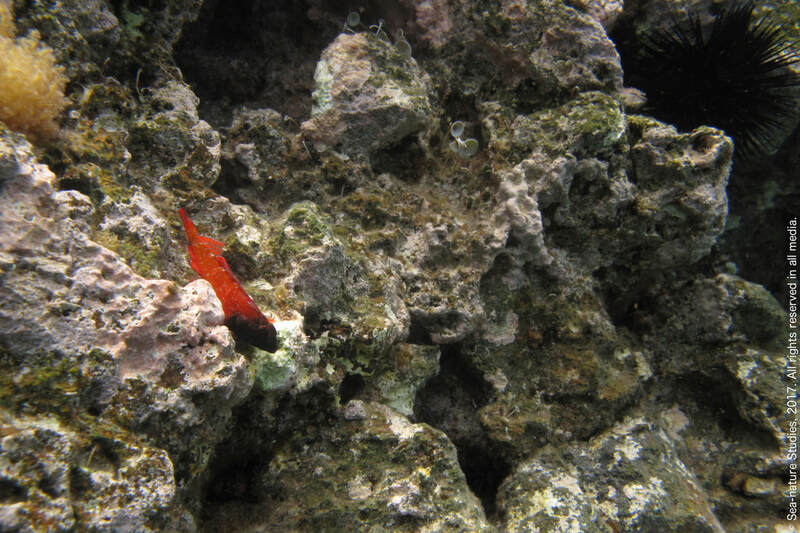 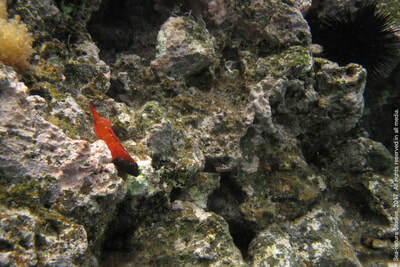 A triplefin blenny, Tripterygion spp. 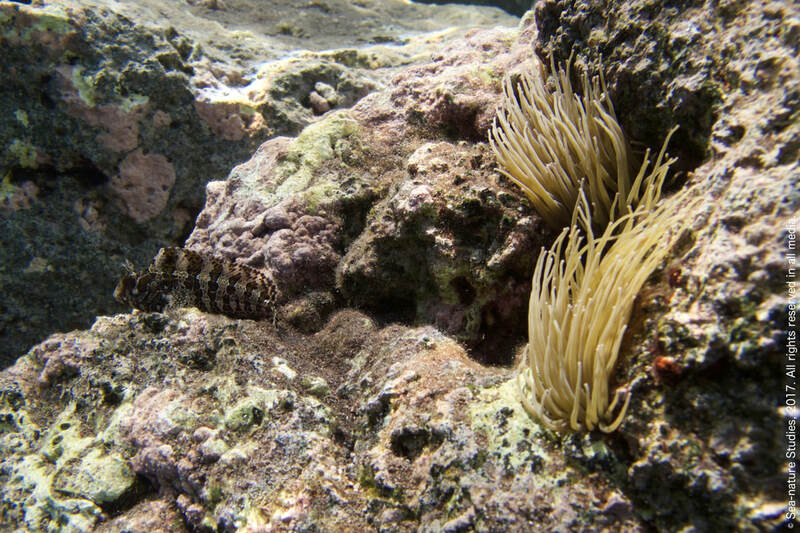 (either Tripterygion delaisi Cadenat & Blache, 1970 (the black-faced blenny) or possibly, Tripterygion tripteronotum (Risso, 1810)).